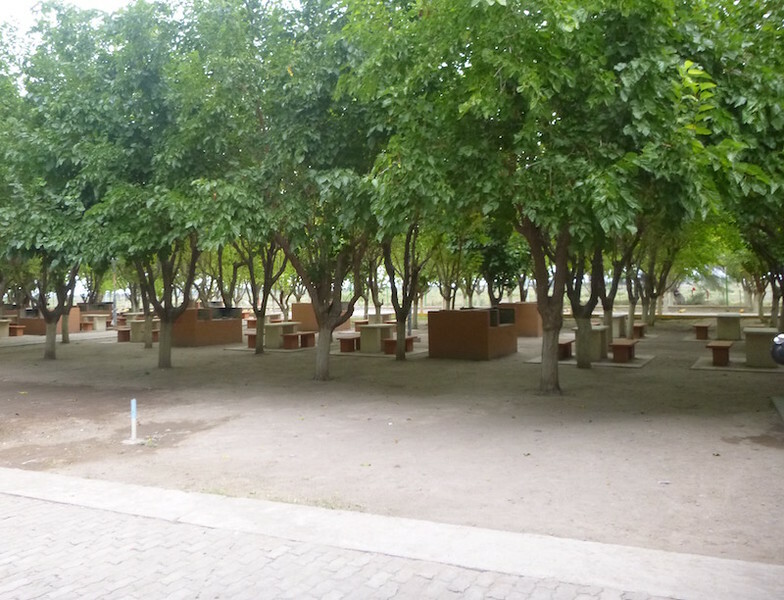 Today was a planned “day off” or “down day” at Camping Suizo in Mendoza. A nice campground. I slept well, at least until about 5am when the storm hit. It rained hard for a couple of hours, then tapered off. Enough to splash mud on all four sides of my tent, even under a canopy of trees. Note to self: If you put your boots under a plastic table hoping to protect them from possible rain during the night, make sure one of them isn’t directly under the sagging umbrella hole, which acts as a perfect downspout. My left boot was half full of water this morning. I’ve been a bit slow on my maintenance schedule on the bike. Okay, maybe more than a bit. The last time I adjusted the valves was in Boquete, Panama, which was 7,500 miles ago. The service manual calls for 3,000 mile intervals. Check intake and exhaust valve clearance. Surprisingly, both were within spec. I’m impressed, considering they are old-school tappet valves with a 3,000 mile suggested interval and they’ve been working pretty hard, especially the last few days on Ruta 40. Adjust and lube chain. This is only the second time in 15,000 miles that I have had to adjust the tiny 428 chain on this bike. So here’s my observation: if you leave home on a chain-driven bike on a trip like this, and you don’t have an O-ring chain installed, shame on you. Nobody in South America carries o-ring chains, for obvious reasons: they are expensive. The dealer in Punta Arenas said he could order one, full payment in advance, with a four to six day delivery time. Not bad. I might take him up on that depending on how it looks when I get there. Unfortunately, he also said he could order the rear sprocket, with a 45 day delivery time. Ouch. I hope to be in South Africa by then. C’mon, Baby. Hold in there. Air in tires. 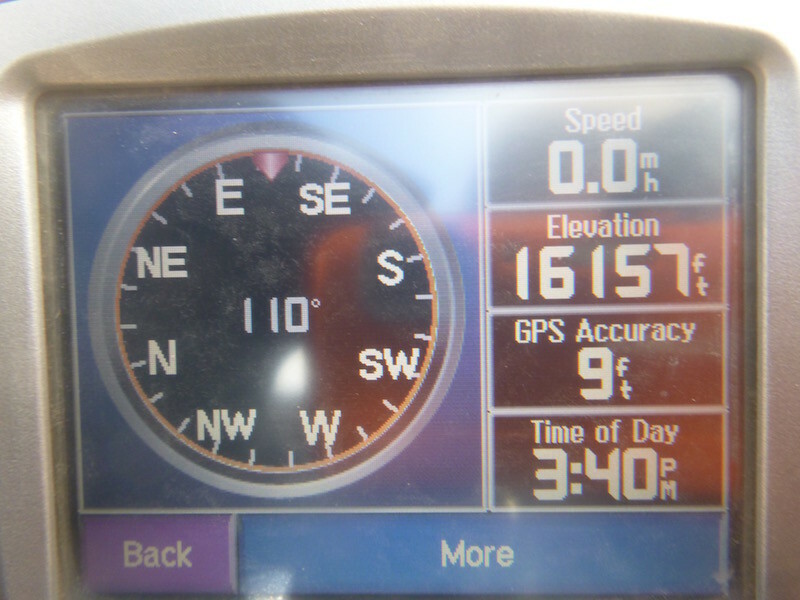 This is the first time I’ve been below 5,o00 feet elevation in a long, long time. 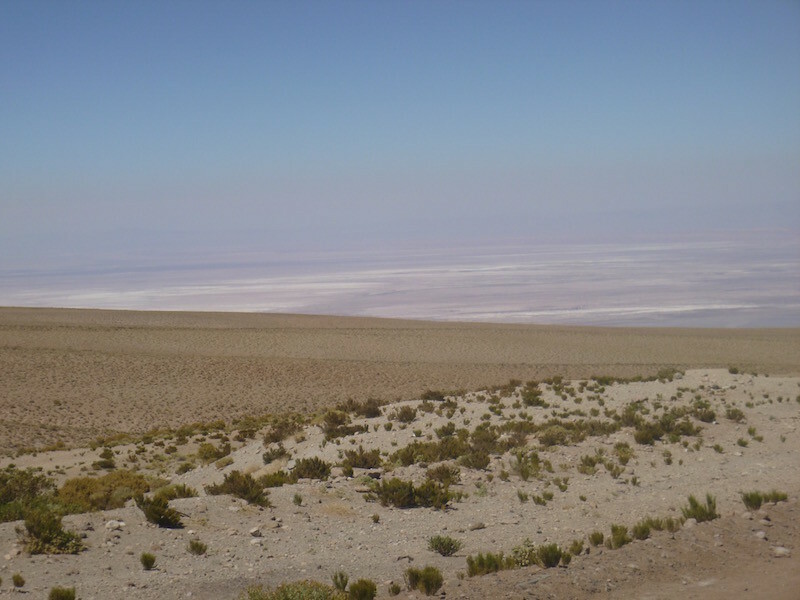 So even though I aired my tires back up in San Pedro de Atacama after crossing the Bolivian desert off-road, they’re a little low due to elevation change. Check air filter. Not as bad as I expected. I’ll leave it in for another few weeks, probably til I get to Ushuaia, then change it. Install three missing bolts in rear rack system. This is the second time the mounting bolts for the pannier racks have vibrated out. Last time, in Mexico, I only lost one. This time, three out of four. (I know….you’d think I would’ve felt them moving around, but the rest of the mounting system still held everything in place pretty well. I can see why people break pannier racks and subframes though. A lot of weight and forces acting back there. Going to look for some Loc-Tite tomorrow. Overall, pretty benign and still amazing for an 18 horsepower 250cc air cooled motorcycle over 15,000 miles. Knock on wood. I’m not fooling myself: things wear. That’s the nature of mechanical engines. It’s just a matter of time. But in general, this one seems to be holding up quite well. About an hour and a half south of Chilecito, I pull into the small town of Patquia. Everything about this fork in the road looks, feels, and smells like west Texas. It’s like I’m in a Twilight Zone episode, and I’ve somehow ended up in Texas, and while the people look like the people I would expect to encounter in west Texas, they speak alien. It’s hot and dusty. I buy an ice cream and a fruit drink, and sit down under the awning, in a Coca-Cola chair next to a Coca-Cola table, just to watch the world go by. Turn down the sound, and this is somewhere east of El Paso, somewhere west of Junction. Two seconds of silence follow. He is staring at me. I am staring back, mouth half open. The woman sitting in the passenger seat, dressed in a flowered sundress and matching RayBans, leans over, placing her left hand on his right shoulder. They both say “Thank you very much” in english, and drive over to another person in the lot, to begin the same conversation again. I mount up and ride west through Patquia and out into the desert on Rp 150, a road that looks, feels, and smells exactly like FM377 heading out of Rocksprings, Texas. And I swear I can hear Rod Serling behind me. As I prepared to leave Cafayate, I stopped for fuel and food…an awesome bakery called Flor de Valle just across from the gas station. I was almost convinced to put it off another day and spend today in the bakery. When I came out of the bakery, this guy was checking out my bike. Turns out he has a Yamaha Lander, a similar model. Heading south out of Cafayate, it didn’t take long until the scenery changed back to desert. If you can imagine a two lane version of Interstate 10 running from Tucson to Van Horn, Texas (east of El Paso), that’s pretty much what this part of Ruta 40 looks like. 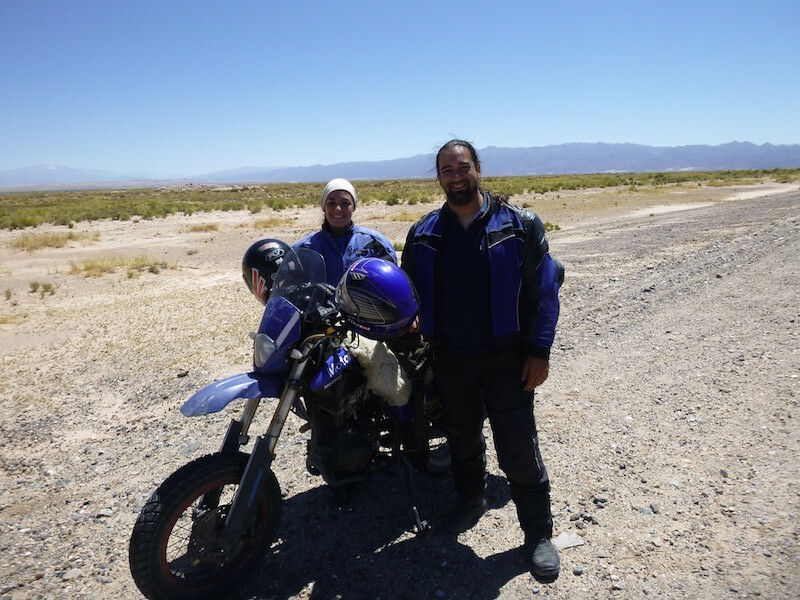 I met this Argentine couple in the middle of the desert. 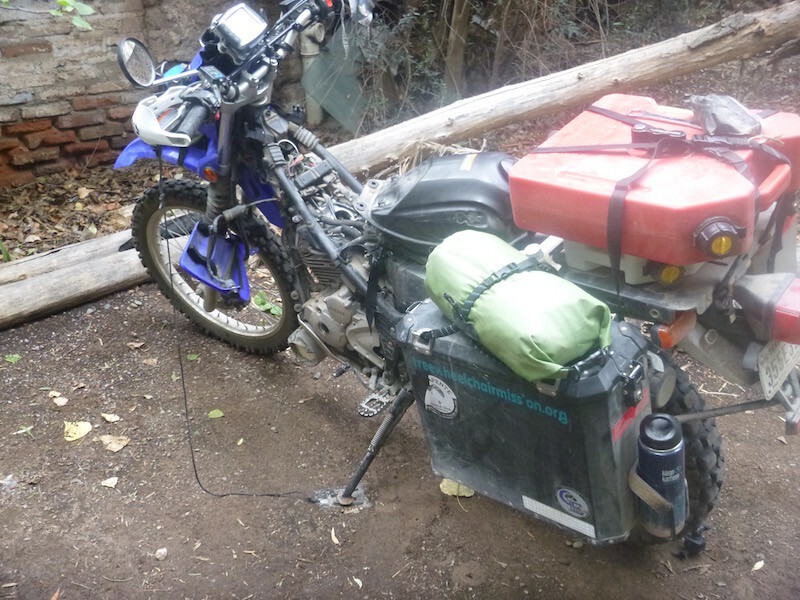 They were spending three weeks riding their Motomel Motard around Argentina. His 20 year old son is currently spending a year riding a bicycle around South America. And I finally found that part of the desert where there is sand, and wind, and blowing sand…. 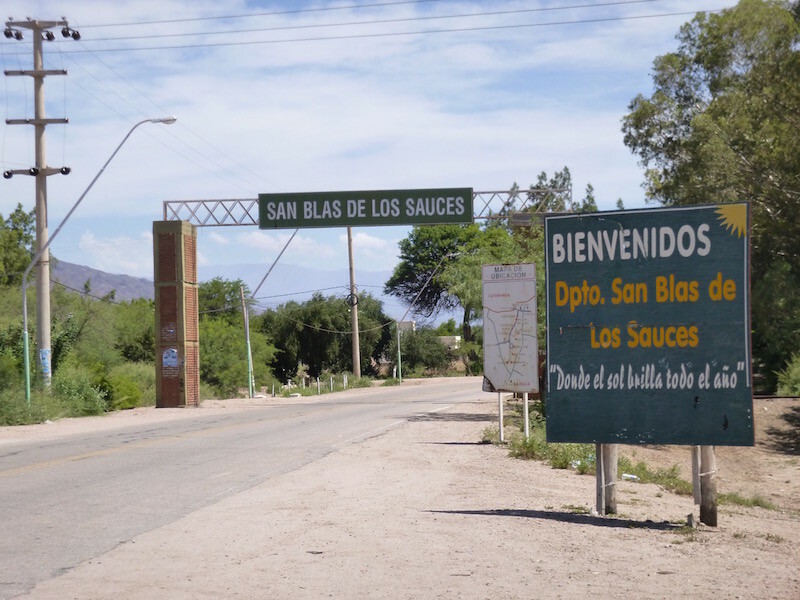 A little further south, I turned at San Blas de los Sauces (I just like the way it sounds), and headed towards Chilecito, my stop for the night. The road through here is constantly changing desert, interrupted occasionally by huge groves of olive trees and large vineyards. “Where the sun shines all year”. No kidding. That’s why it’s called the desert. The hotel I planned to stay at in Chilecito turned out to be full, and also turned out to be right next door (as in attached) to the Yamaha shop. I found another hotel in town and decided to try to change my oil the next day before leaving town. In the morning I stopped at a huge motorcycle accessory store (okay, maybe not huge by Chaparral standards, but it’s the biggest accessory store I’ve run across thus far). I bought two quarts of oil and asked about a place I might be able to change my oil. The counter person pointed me down the street to a “Taller de Motos” (repair shop), but when I got there, the shop was shut and two guys next door said he would be back in an hour. I decided to try the Yamaha shop, since I knew where it was. Typically, these are sales-only outlets, but I figured they would know where to send me. The guys at the Yamaha shop were incredibly friendly. They had a small workshop in the back, and offered to let me use it to change my oil. They had me roll my bike through the showroom into the shop (I was a bit embarrassed, considering how filthy it is), they helped me put it on the lift and offered the use of their tools. In fifteen minutes, I had my oil changed, and was back on the road. They refused to accept any payment for the use of their shop. 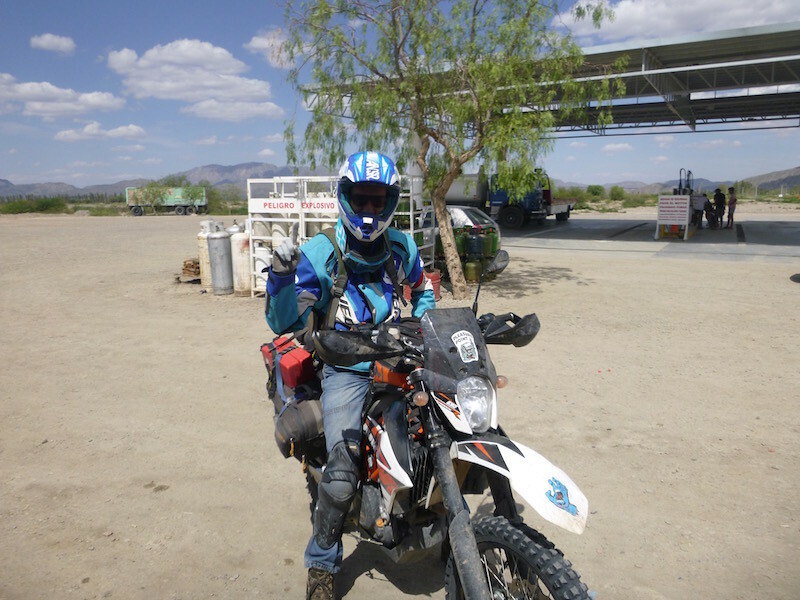 It was another long day of desert riding along Ruta 40. I will amend my previous post, and say that there are indeed still people in Argentina living in mud-brick shacks with little roofing materials, but overall the numbers seem to be considerably smaller than where I’ve been recently. Although this is the desert. It could be that they’re just not living here. However, there definitely appears to be the emergence of a “middle class” here that I haven’t seen elsewhere. There are small “subdivisions” of very small cookie-cutter homes, much nicer than the cobbled together dwellings of the very poor. This guy was interesting. Besides being probably 6 foot 7 inches tall, he’s from Germany, and came to South America without a motorcycle or even a plan of riding one. 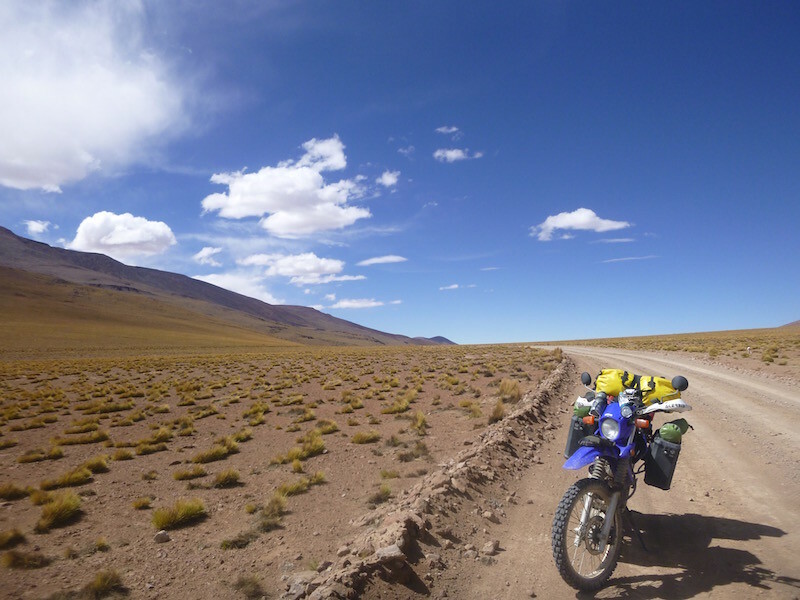 After a month, he decided to buy a motorcycle and start riding around Chile and Argentina. Note the improvised gear: shin guards over jeans, off-road jersey. I’m surprised he found any gear that fit! I was headed for the Municipal Campground in San Martin. When I got there, I was surprised not only at the large size of the campground and its’ facilities, but the fact that no one was there. I pulled around to a side gate, and found a guy working. He confirmed that they were closed, and I asked him if I could possibly camp there for one night anyway. He pulled his phone out and called his boss, who came over and told me I was welcome to stay, for free. He showed me where the bathrooms and showers were, and pointed out that the first guy I spoke with lived on the property, and would unlock the gate in the morning and let me out. I had the whole place to myself, and locked in! Very nice empty campground, all to myself! In the morning I decided to sleep in, since I only had a 100 mile day planned. At 7:30, I got up and headed to the shower. Other than the guy from yesterday, who was working again, and a couple of dogs, there was no one around. Where did all these people come from?!? 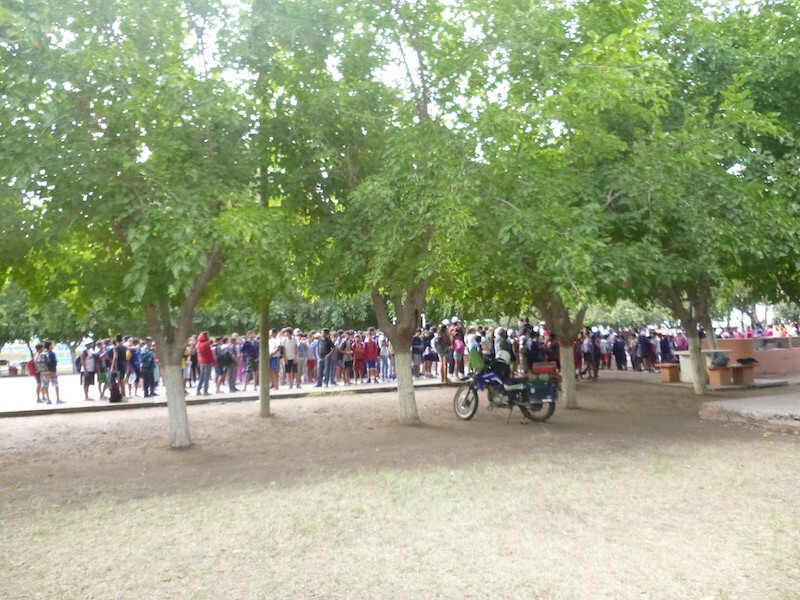 In that fifteen minutes, a dozen buses had pulled up with probably 500 school kids of all ages. They were fascinated with my tent, taking turns looking inside. I looked around for a teacher that might speak a little english, hoping that I could answer their questions with a little help, but no luck. The teachers seemed more concerned about keeping the kids away from the strange gringo. 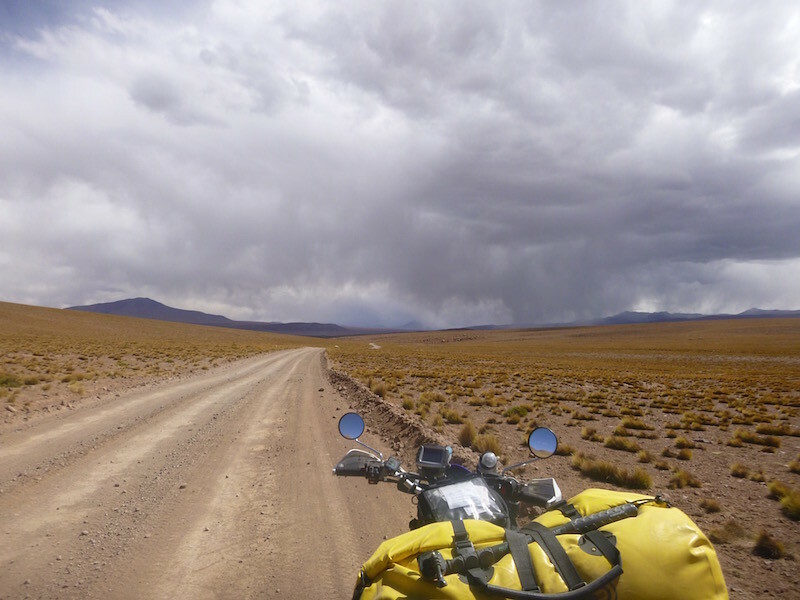 So I packed up and headed south towards Mendoza. I left Casa de Mireya in San Pedro de Atacama, Chile mid-morning. No real hurry. I was only going 170 miles to Pastos Chicos, a hotel and restaurant standing alone in the middle of the desert due east in Argentina. Sure, it was a fairly long 170 miles, as it crosses two mountain ridges, so there was a lot of climbing and descending. I rode up and out of San Pedro, back the way I came, but passed the turnoff to Bolivia and headed for Paso de Jama. It’s all desert here, but the scenery is fantastic. 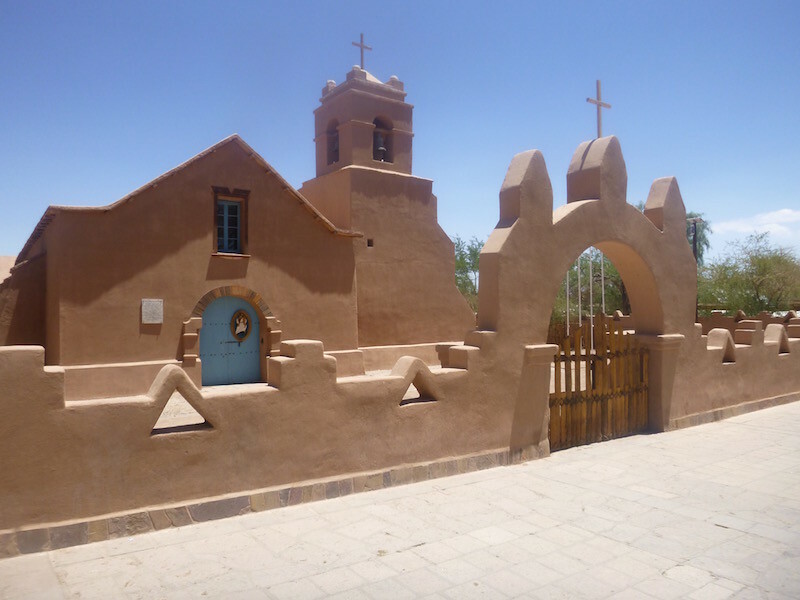 Church in San Pedro de Atacama. Very touristy, but a cool town. 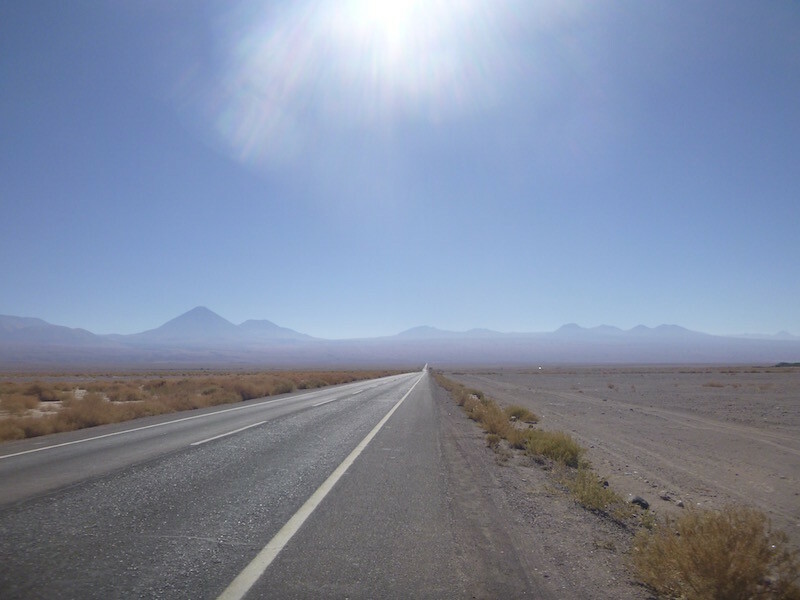 Heading out of San Pedro de Atacama in the morning. Hard to see in this photo, but the highway goes straight to the mountains, then an extremely steep climb up for many miles. Looking back down on the Atacama desert floor from above San Pedro. Beautiful desert, mostly at around 14,000 feet. Amazing to see this river running through the desert. There are a lot of salt lakes up here, and I imagine this water has a high salinity content also. The wind was blowing hard high in the desert, at times upwards of what felt like around 40 to 45 miles per hour. It was odd to be struggling with the bike in the wind, in the middle of an open desert, and not have any sand blowing around. Everything here is much larger and heavier than sand: gravel, rocks, etc. It hasn’t decomposed to the sand level. So even in strong winds, there was no debris in the air. I have a knack of arriving at borders at just the wrong time. As usual, I pulled up to the border right behind three large tour buses full of mostly backpackers. I got in line behind them and went through the immigration process. Both Chile and Argentina Immigration and Aduana are all in the same building. Fortunately, after the backpackers passed through immigration, they got to skip Aduana since they weren’t bringing vehicles in, so the process sped up considerably at that point. Walking out of the joint border crossing building, I looked around and noticed that there were no money-changers around. At most border crossings, there’s either individuals walking around offering to change your money, or there are small shacks set up with “Casa de Cambio” signs on them. Not here. Absolutely no place to change money. Keep in mind that this is in the middle of the desert. The nearest towns are San Pedro de Atacama, Chile (about 100 miles west), Uyuni, Bolivia (about 325 miles north), and Jujuy, Argentina (about 200 miles southeast). So I was now in Argentina, and the nearest place to change money into Argentine Pesos was a hundred miles behind me in Chile. The next was two hundred miles in front of me in Argentina. Next door to the border station on the Argentine side is a YPF gas station. I pulled in there thinking maybe I could change some Bolivianos or Chilean Pesos there. Nope. But fortunately they did take MasterCard. Not Visa. Only MasterCard. And I happened to have one. So I was able to get fuel, just no food. Another 75 miles or so through the desert I came to what I had planned to be my hotel for the night. Again, unfortunately, “solo effectivo” (cash only). It was only about 2:30pm so I decided to keep rolling in hopes of finding a small village with an ATM. A couple of hours later I pulled into just such a village. Even though it was Monday, there appeared to be quite a market going on near the Central Park area. Across from the park was the ATM. I stuck my card in it and immediately got the “Your Card is Not Accepted Here” message. Back on the road, headed for Jujuy. As I wound down the mountain I dropped from clear blue (and I mean really blue) skies into the clouds, and it started to drizzle. I popped out at the bottom and it cleared up again. Then within about five miles, I suddenly found myself in the thickest soup of a fog I think I’ve ever ridden in. It lasted for about 30 minutes, then cleared off again. At this point it was getting close to dark, and I decided that I would head directly for Salta, as it is a big city, and I knew I would find an ATM there, as well as the hostel I originally planned to stay at the following night. 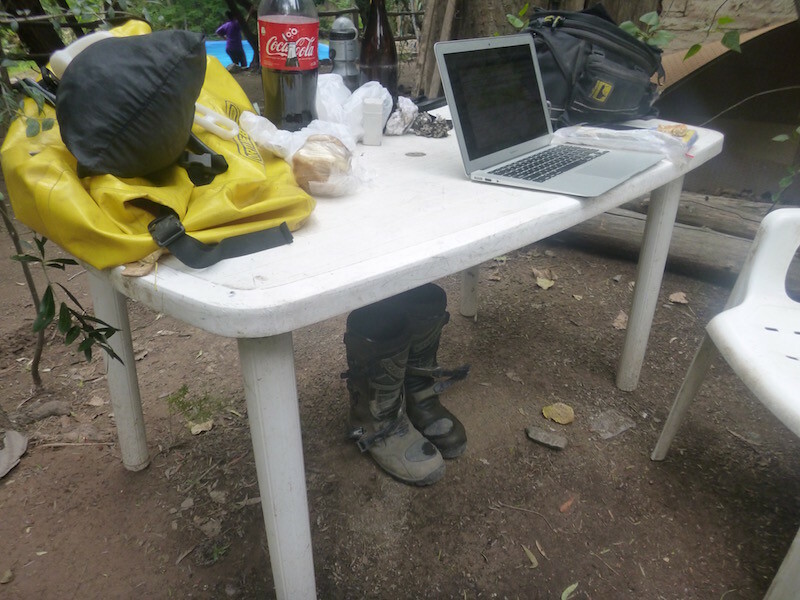 An hour and a half later, and well after dark, I arrived in Salta, found the hostel (cash only) and convinced the manager to let me put my bike in the lobby and my stuff in the room and walk (hobble, actually) to an ATM five blocks away. This one took my card, and I now had enough Argentine Pesos for not only a room but a meal. I had ridden 352 miles today. Much longer than I intended. It must have been a holiday Monday, as there was a HUGE party going on in Salta, and the main part of it, with a huge outdoor stage and nationally famous performers, was being broadcast live on television. I still don’t know what holiday it was, but people were out in force at 11pm. The next morning I woke up late, had a leisurely breakfast, and slowly packed and hit the road for Cafayate. I was in no hurry. It was only 118 miles. But what a lovely 118 miles it is. 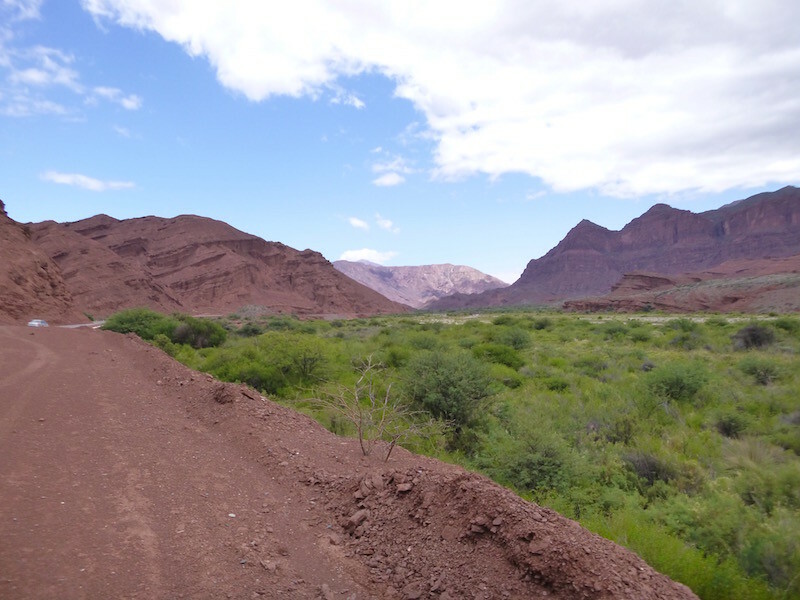 Ruta Nacional 68 south of Salta passes through some absolutely beautiful green farmland. The green is almost overwhelming after so much time in the desert. Farms are large, crops beautiful and bountiful with huge leaves. Everything here is very different from what I had been experiencing for the past month or two. The rural people, for the most part, seem to live better than in the last few countries I visited. Certainly not everyone, but a large percentage. The lower-end homes are nicer, and the land looks better. Many houses have driveways, and people here own cars, which they tend to drive in a respectable manner. There are a lot less buses and collectivos shuttling rural residents to and from towns. Which means there are a lot less people sitting and standing next to the road everywhere. I haven’t seen it like this since I left Texas. The downside of less buses and collectivos is that the backpacker population, which is huge here, is left with less ride choices. There are a lot of people with large backpacks hitchhiking along Ruta 68. 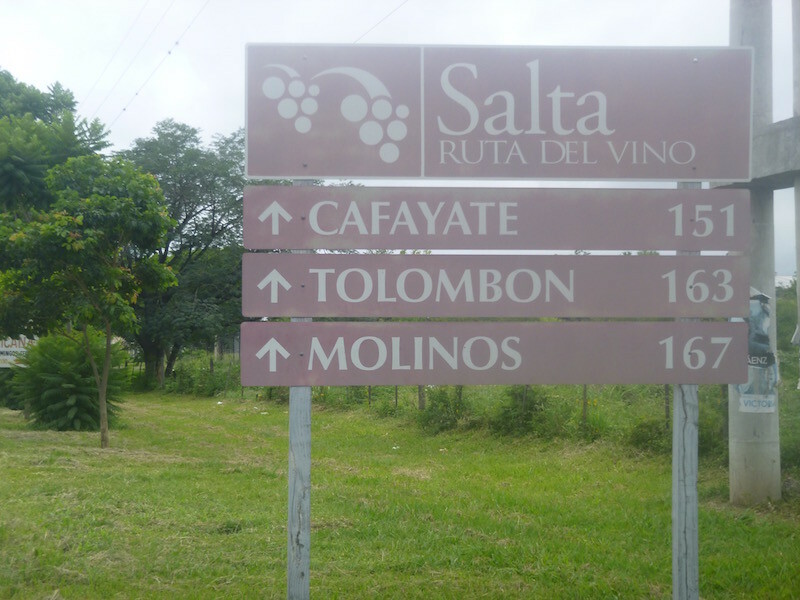 This valley that Salta sits in is the northern end of the wine region here. 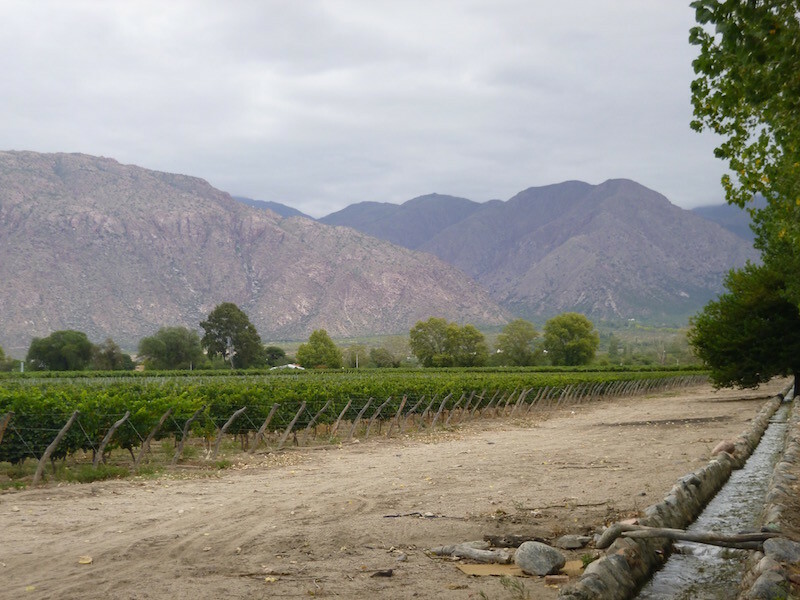 The wine trail is a long one in northern Argentina. 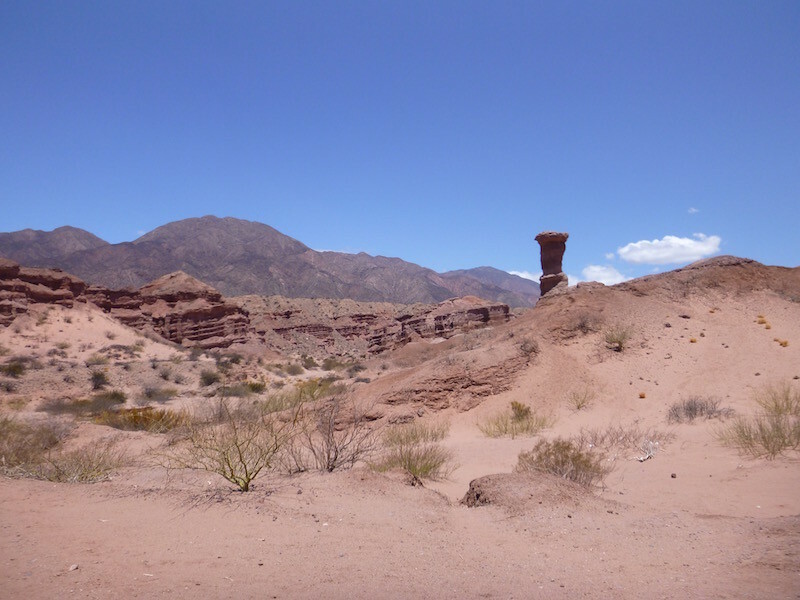 About fifty miles south of Salta, the road starts to climb a mountain, and the lush green valley starts to go away, returning to desert, but yet another, different desert landscape. 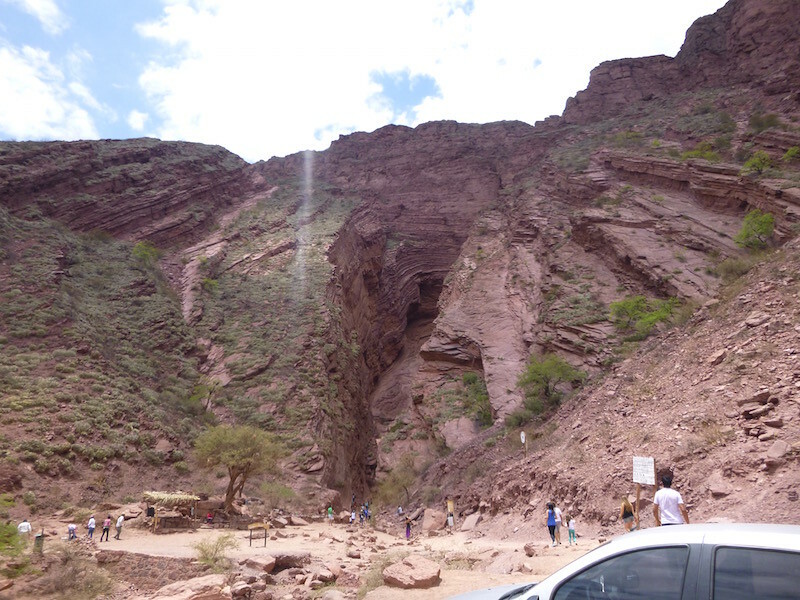 This large chasm on the side of the road was very popular, and there were lots of people walking up into it. The rock formations here were beautiful. 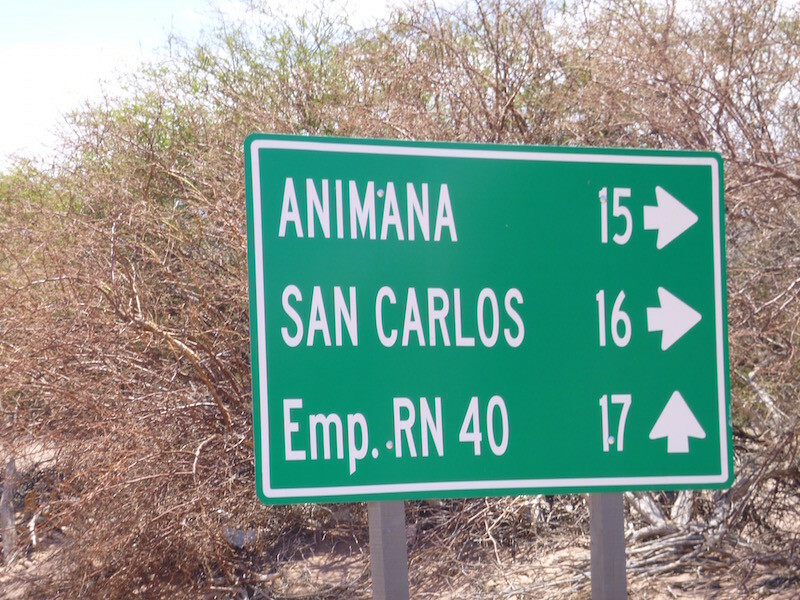 Do you think the people of Animana are called Animaniacs? Sorry, couldn’t resist. And then, just before Cafayate, the vineyards appear again. Vineyards line the road on the way into Cafayate. Parts of this area remind me of some of the roads in central Italy and southern France that I’ve ridden. An impressive estate vineyard just outside of Cafayate. 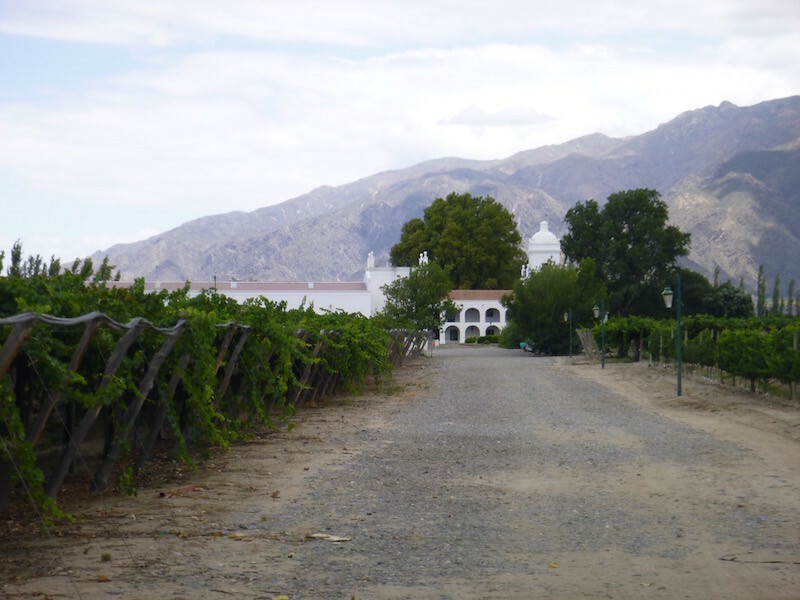 Cafayate is all about vineyards and wineries. There are a number of wineries here, offering tastings, and the town square is literally ringed with sidewalk cafes. 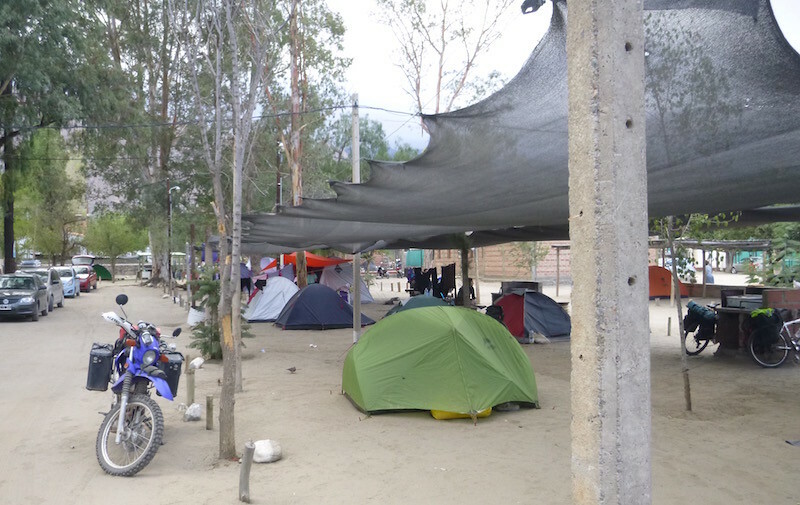 The campground just south of town, Luz y Fuerza, is packed with tents. Tourism here is mostly national. Lots of Argentines enjoying their version of Napa Valley. Lots of tents in this campground. 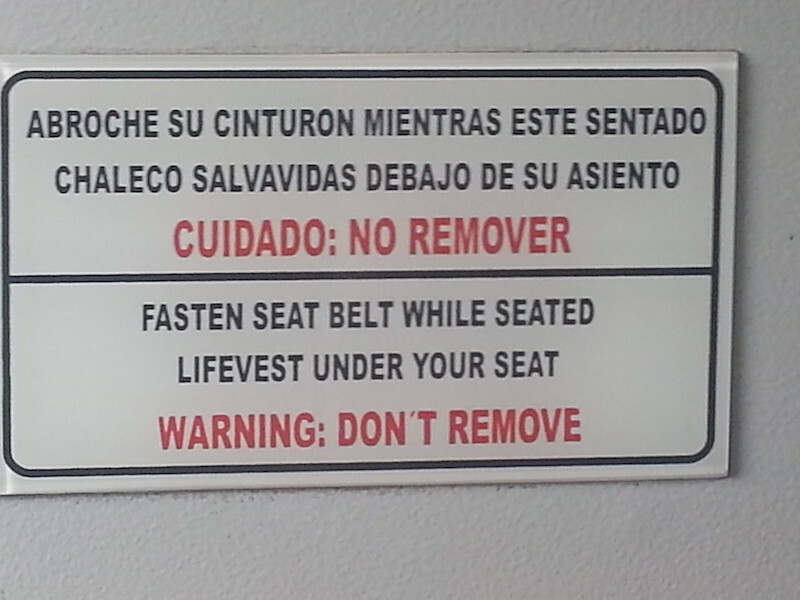 Unlike most everywhere else, I didn’t hear a word of anything except Spanish. These are mostly Argentine nationals, enjoying their own country. 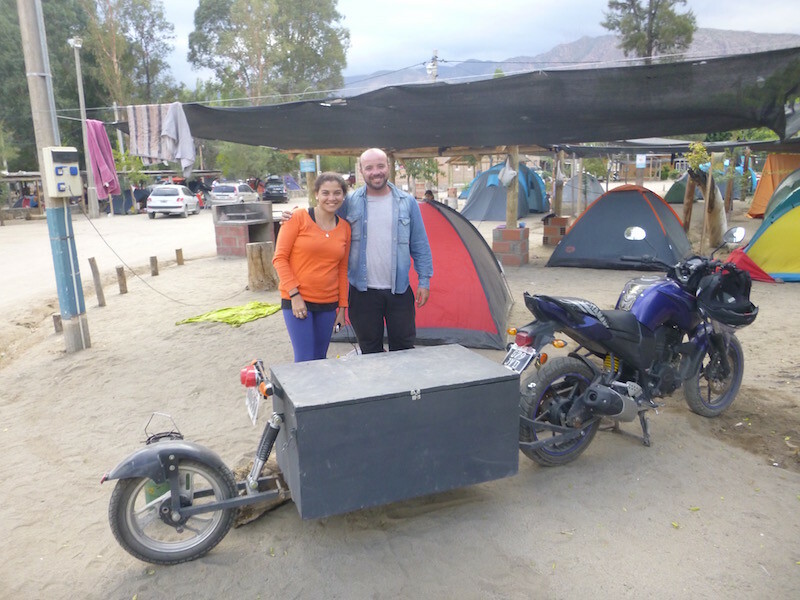 In the campground, I met this Argentine couple, touring their country two up, and pulling a homebuilt trailer behind their 150cc Yamaha FZ. He told me they hope to visit Chile and Peru on it next year, and possibly further north. 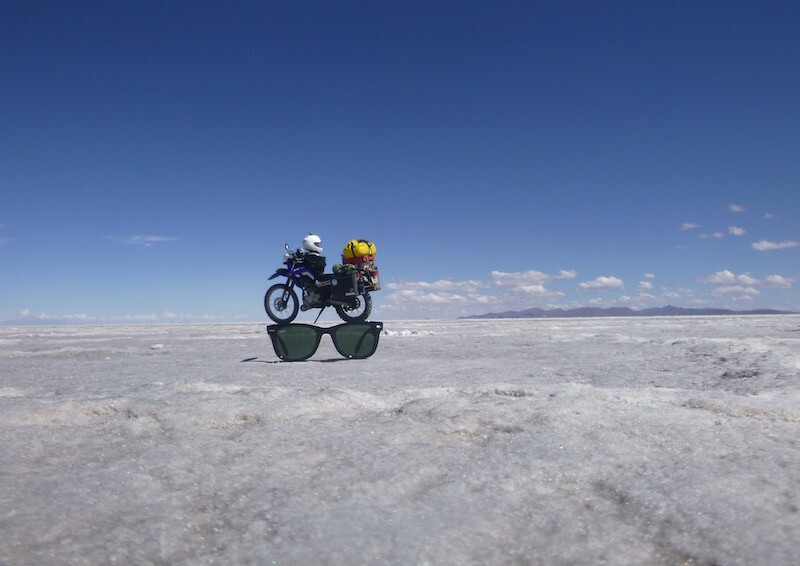 So the next time you tell me you need a 1200cc bike to do this trip two-up, think of these two. I’m sure this will make the next Martha Stewart book: Don’t have a shower curtain? 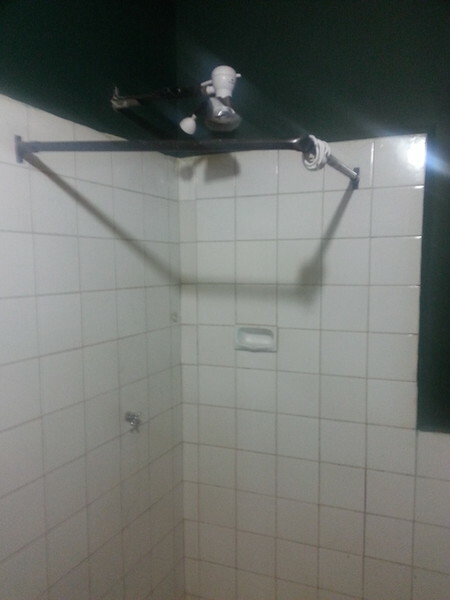 Or don’t want the ugly inconvenience of a shower curtain, but want to keep the water in the shower? Simple! 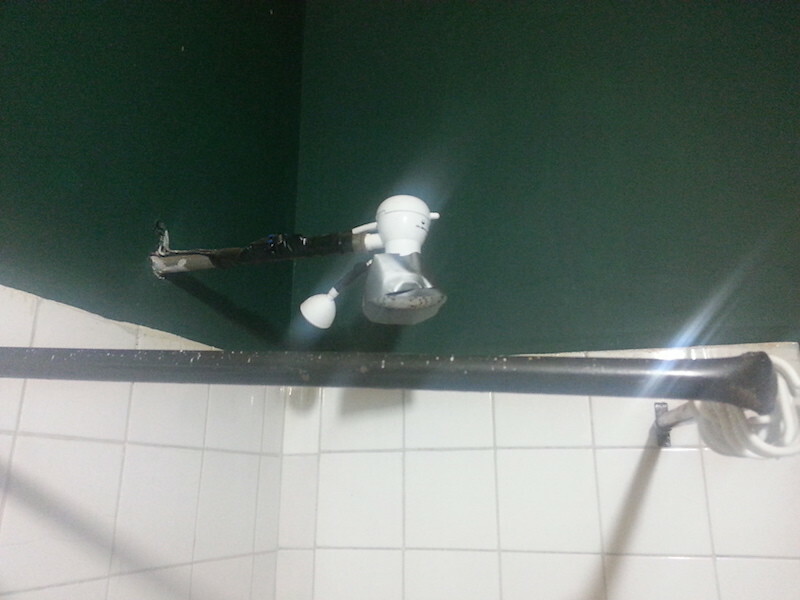 Wrap duct tape around the shower head to act as a diverter. Well, it kinda works. And it IS cheaper than a shower curtain. 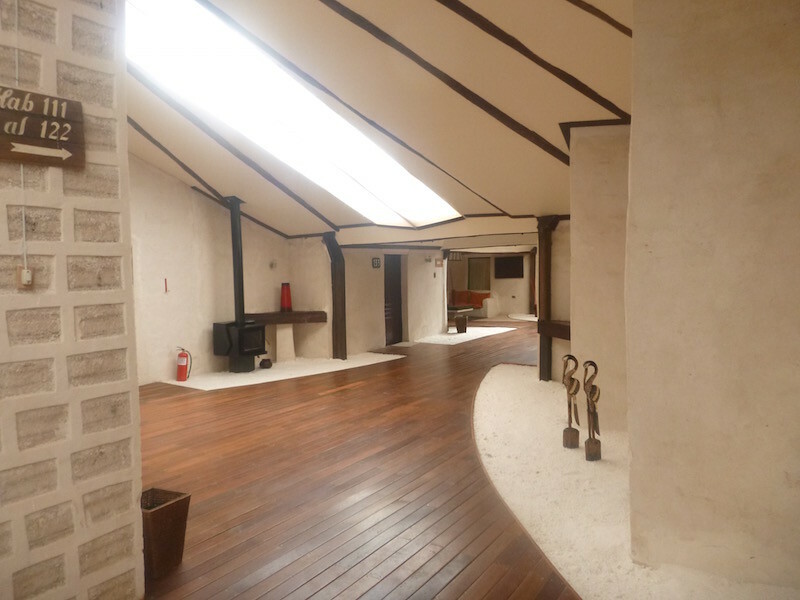 Yep, this is what you pay for when you stay at the hottest places in Bolivia. It was getting late in the day. I was still an hour or so from the border with Chile, and it would be dark before then. I began looking for a place to camp. There is nothing out here. Nothing to hide behind from the wind. Most of the ground is rocks. Not exactly good tent space. 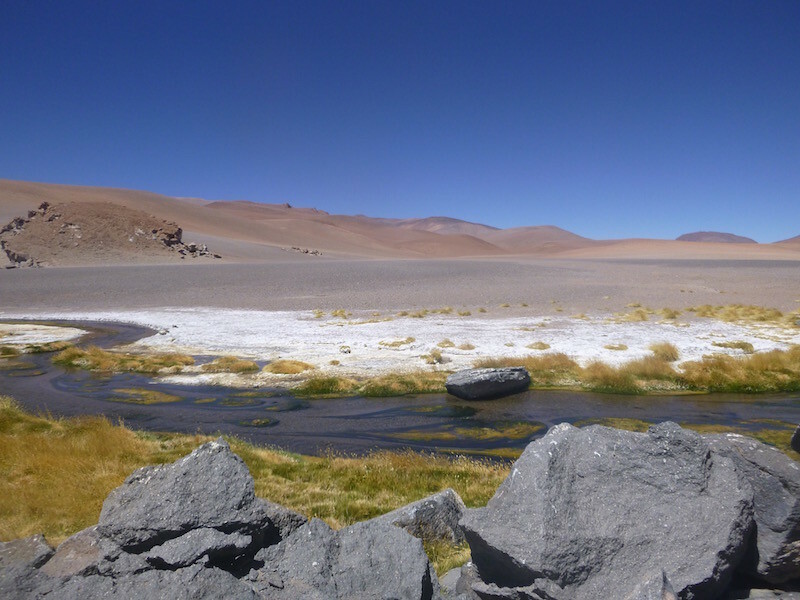 I came alongside the Laguna Verde. It’s deceiving how a piece of land can look green in the distance and when you get there it is just shards of rock. For much of the past 100 miles or so I had been on my toes, literally and figuratively. The road constantly went from fairly hard-packed to dangerously loose in the blink of an eye. Ruts from four-wheel vehicles dug through the deep, loose gravel, making the bike squirm uncomfortably at speed as I attempted to either power through the shorter stretches, or gently back off the throttle and maintain enough momentum but at a slower speed to make it through the longer ones. I kept thinking how miserable this would be on the Super Tenere or any large beast of a bike. Finding some firmer footing, I rode along at about 40 miles per hour alongside Laguna Verde. Suddenly I hit one of those deep “pits” of gravel in the road. The front end dug in, and the back end began to come around. Before I could react, the rear swapped the other direction, and off I went, face first into the sharp gravel. My Shoei and Klim gear did a good job of protecting me, although the face shield of the helmet flew off on impact with the gravel. Unfortunately, my left ankle got caught up somewhere, somehow and I immediately knew when I hit the ground that it wasn’t good. I sat there for a minute or two assessing the situation. No hurry to get up since there would be no cars coming. The only hurry was that it was going to get dark and I needed to find a camp spot. I slowly got to my feet, and realized that only one foot was going to be useful in picking the bike up. It was a struggle, but I managed to eventually get the bike back on its’ wheels, and me on it. No damage to the bike, that I could see. I very cautiously started off again. Ahead several miles, at the southern edge of the lake, I could see what looked to be a building. I decided I would see if someone was there. If so I would ask to camp next to their house. If not, perhaps I could camp in their house. As I approached I saw two buildings, one on each side of the road, with the road blocked between. Two men sat outside the building on the right, wearing uniforms. I rode up and said “Buenas tardes”. They were in a good mood, as their day was about to be over. This was the Bolivian Aduana checkpoint, several miles from the border. I could go no further today even if I wanted to. I told them I had injured my ankle, and asked if I could camp next to their building. They agreed, and one of the men went inside and returned with a pole that I could use as a cane. At this point, I was having trouble just walking, so I gladly accepted it and set about pitching my tent. It was a cold night at 15,000 feet elevation, but I was surprisingly comfortable in my tent. I was able to get my ankle out of my boot (not without some pain), and it had swollen to look like a baseball. I took one of the two painkillers I had in my kit, along with two ibuprofen, and wrapped my ankle with the ACE bandage from my first aid kit. All in all, it could be much worse. I slept fairly well, in between propping up my ankle again and contemplating how I was going to get out of there. The next morning my ankle was considerably larger than normal, and I still couldn’t put any weight on it. I very painfully forced it back into my boot, slowly packed up, checked my bike out of Bolivia, and climbed onto the bike to head for Chile. The guards thought I was nuts for continuing on, but how long could I camp next to their guard shack in the desert? I immediately realized I couldn’t bend my ankle to upshift, so I had to put my foot in front of the shift pedal and use the heel of my boot to kick the shifter up. For the most part, I remained in second and third gear, not wanting to take chances with the gravel. 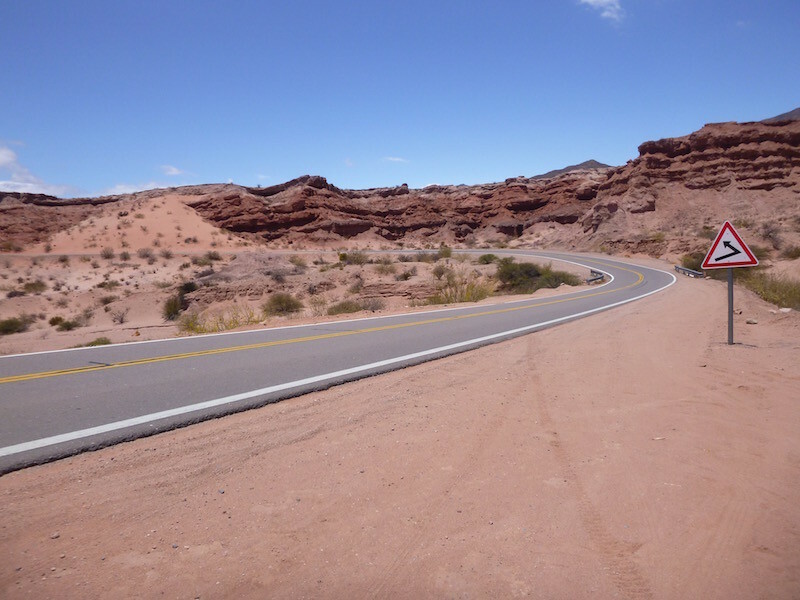 As soon as I crossed the actual border, the road turned to pavement and I headed down the hill to San Pedro de Atacama, a Chilean town in the middle of the Atacama desert. 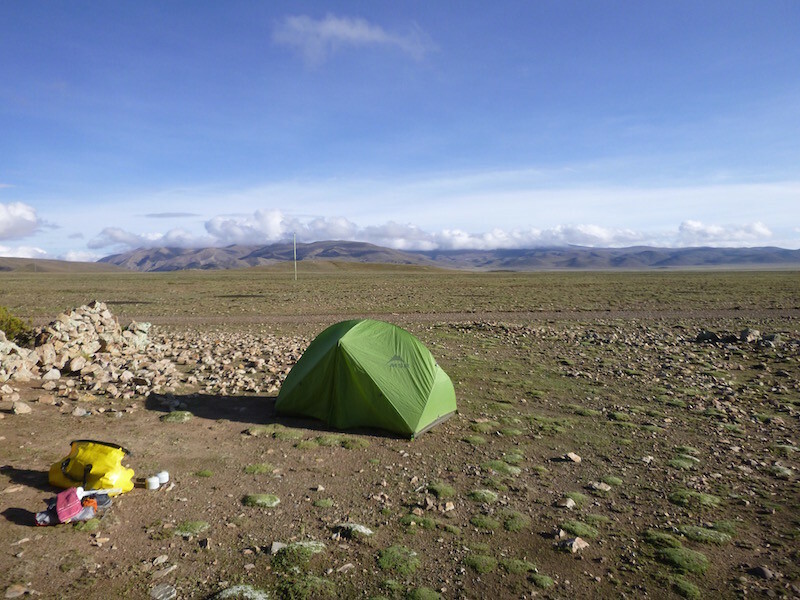 I had planned to camp here, but in my current state, climbing in and out of the tent was difficult. I found a hotel and checked in, then headed to the local hospital. 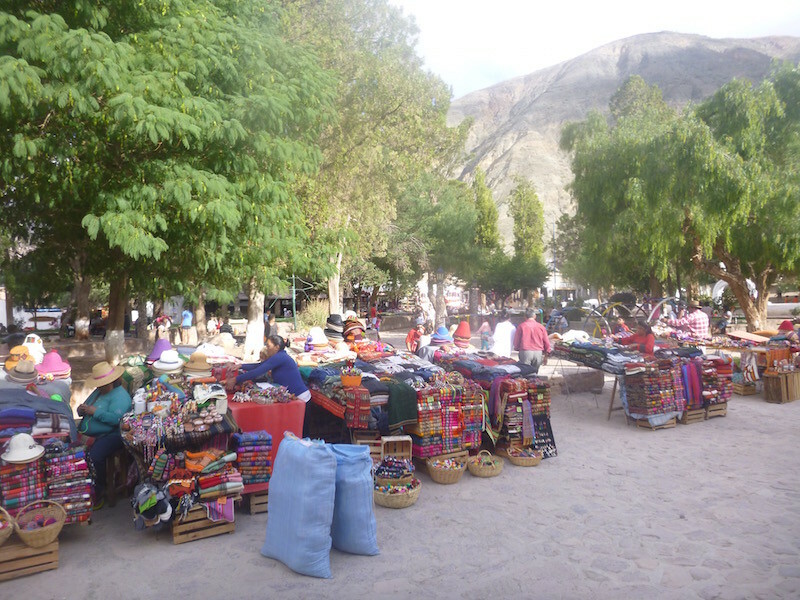 San Pedro de Atacama is a quaint village with a large tourist population, and the center of town is pedestrian only. The bank (ATM — I needed Chilean Pesos) and the hospital are both within this pedestrian area. Which meant I had to walk/hobble to the bank and the hospital. Ouch. After getting some money, I went to the hospital only to find that they don’t have an x-ray machine. The nearest one is in Calama, about an hour away. The nurse looked at my ankle, felt fairly certain that it was just a bad sprain, and gave me an anti-inflammatory injection. Back on with the boot one more time, and I returned to the hotel intent on a few days rest with an elevated foot. The hotel owner offered to have her husband or son drive me to Calama for another examination and an x-ray, but I declined, telling her that if it didn’t look and feel better in a few days maybe I’d take her up on the offer. She sent her son to the pharmacy to get some ibuprofen and a coke for me. I propped myself up and started searching for wi-fi. This morning the swelling is going down, although I can still barely walk on it. But I’m headed in the right direction, I hope. Perhaps in another couple of days I’ll be headed east, into Argentina, and south again. All of the previous border crossings I have done go like this: Arrive at border, check bike out of country (Aduana), check self out of country (Immigration), cross border (usually a river, or a bridge, or a line, or a gate), check self into country, check bike into country, ride into next country. This one is different. Miles before the actual border, you pass Bolivian Aduana in the middle of nowhere. You have to stop and check the bike out here. 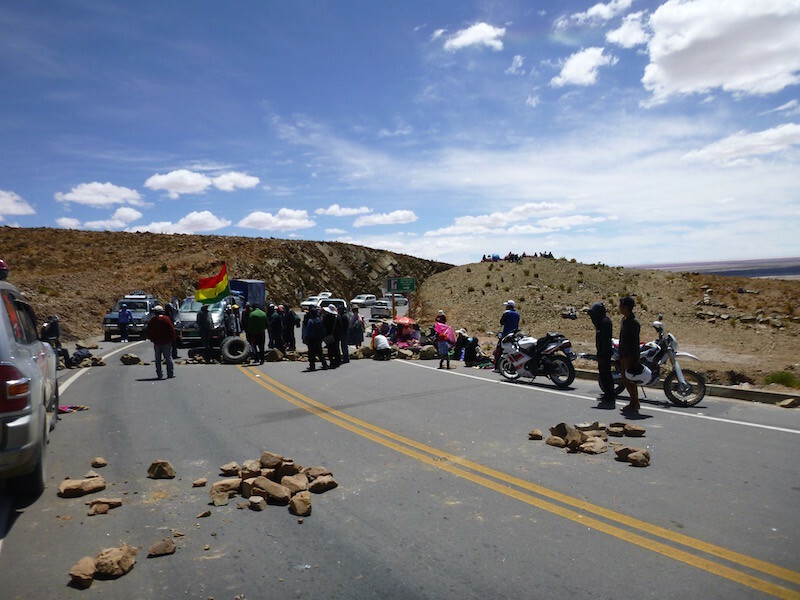 Then you continue for several miles in Bolivia until you arrive at the actual border, where there is Bolivian Immigration. You check yourself out here. There are no Chilean facilities here. 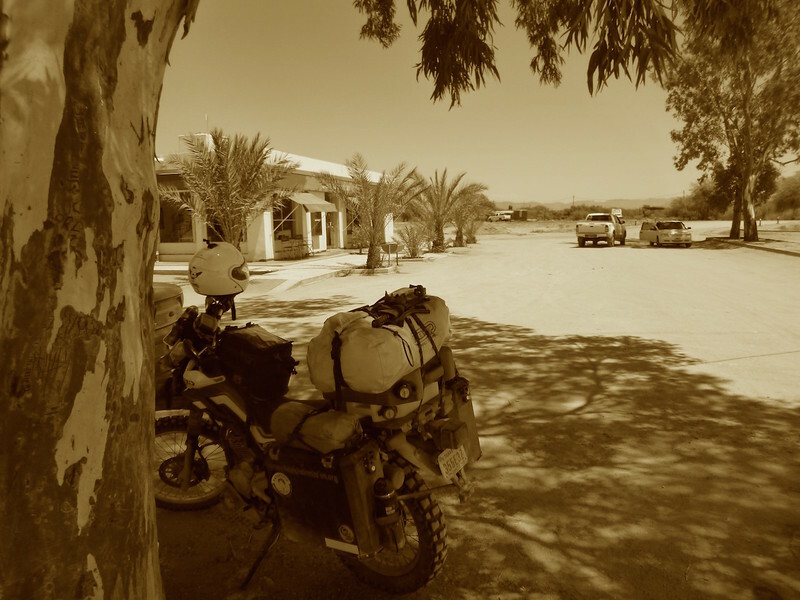 You have to ride another 30 or more miles to the town of San Pedro de Atacama where the Chilean Immigration and Aduana are housed in the same building in town. Makes it pretty easy to miss a step if you aren’t paying attention. It also says to me that even the Chileans don’t care about the land nearest to Bolivia, and I can’t really blame them. My first experience in a rural foreign hospital left me with a sense of what Mexican and Latin American nationals must feel like in a hospital in the US. You have to trust that the language skills and interpretations are good enough to get what you want and need without getting something you don’t want or need. It can be a somewhat frightening experience, and at some point you have to put your trust in the system, and hope there is a system. At the end of the day, for an emergency room examination and a shot, I paid $21. My insurance co-pay would have been more than that in the US, and then I probably would have received another bill for another couple of hundred dollars later. Far more simple than trying to use the insurance I paid for, although perhaps I will consider applying for reimbursement yet. This has to be my highlight of Bolivia. It’s an odd little town on the edge of the world’s largest salar (salt flat: over 4,000 square miles), and as I said earlier, the initial appearance as you descend into the town from the mountains (or from an airplane I would imagine), is that it looks a bit like the temporary city of Burning Man: a small community surrounded by vast nothingness. 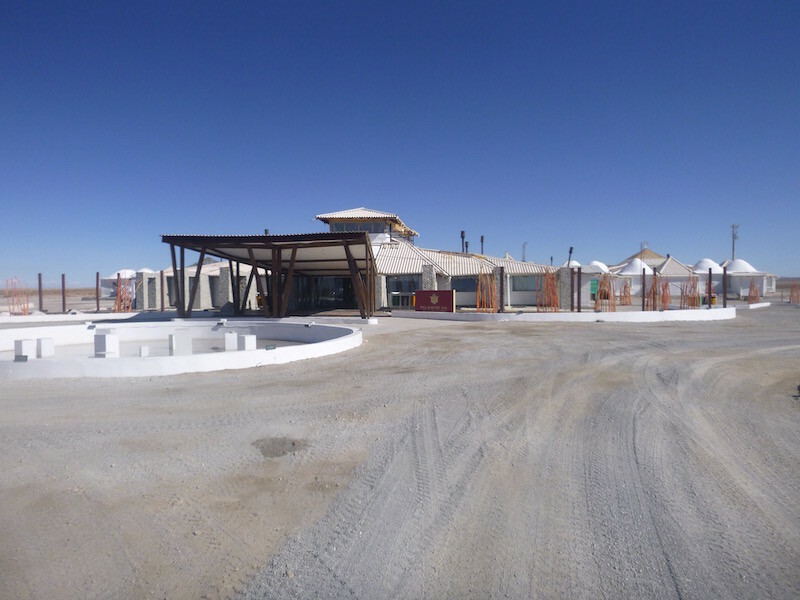 Aside from tourism, there isn’t a lot going on in Uyuni. But the town has definitely capitalized on the tourism. For such a small place, it is amazing how many US, South American, Asian and European tourists are present. 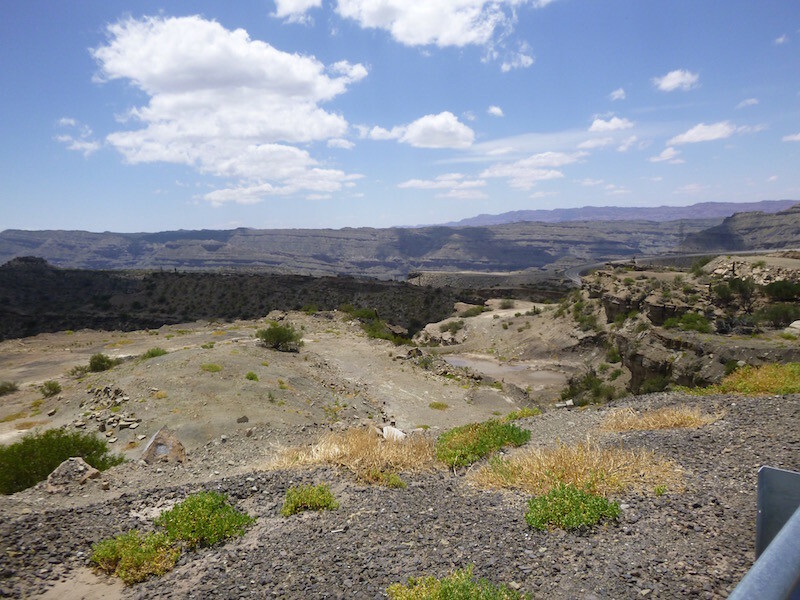 The Salar attracts the tourists, but there is a lot going on here as well. 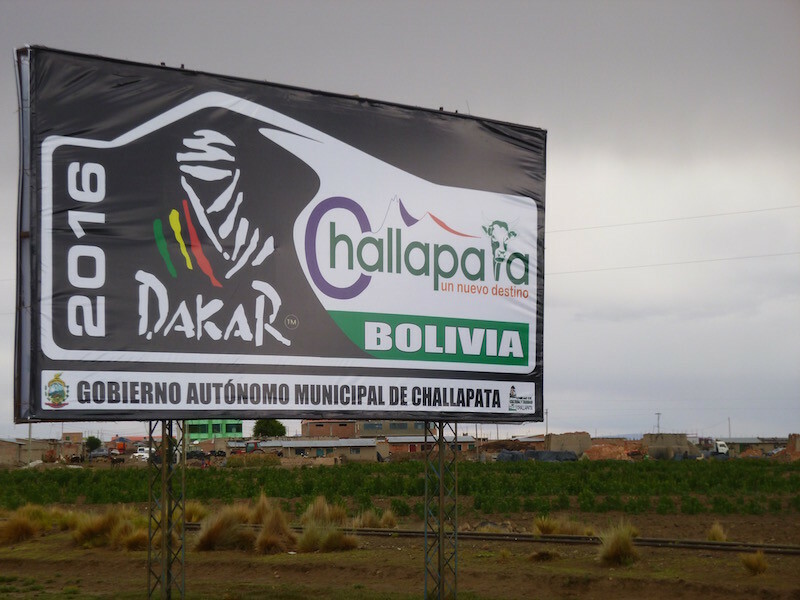 Just ten days earlier, the Dakar race came through here. I wish I had been present for that, but timing just didn’t work — this year. The Salar is definitely huge. 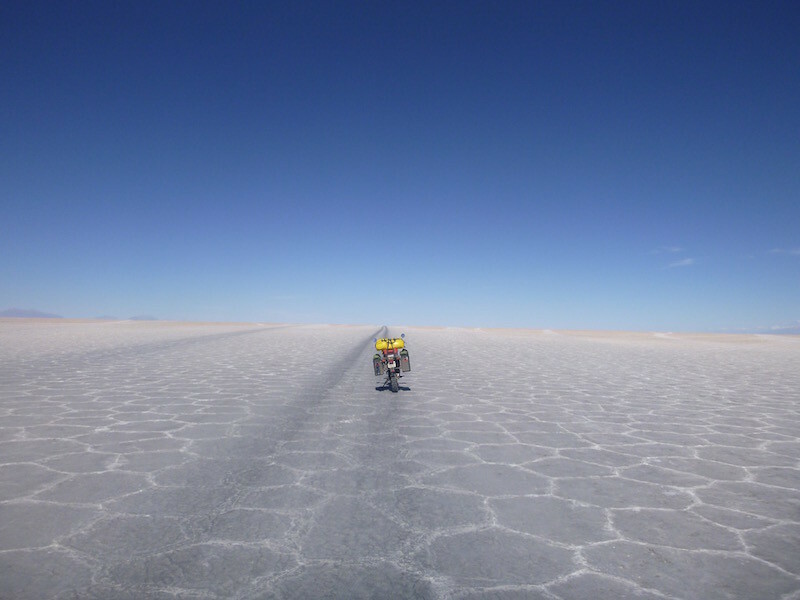 It’s amazing to ride across something and see nothing at the horizon but more vast salt flat. Forever, it seems. 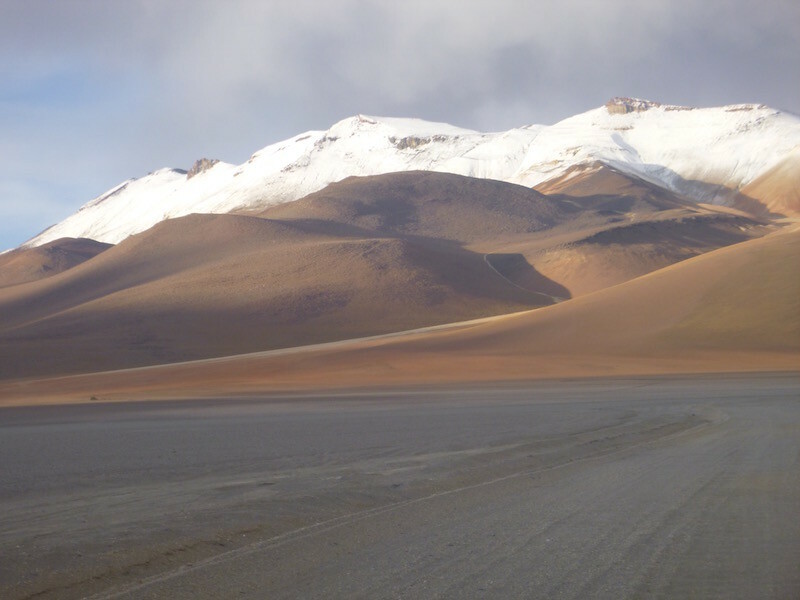 The Road Goes On Forever…there are definitive roads across the Salar. Besides the tourist jeeps, I saw local buses transporting people across this way as well. 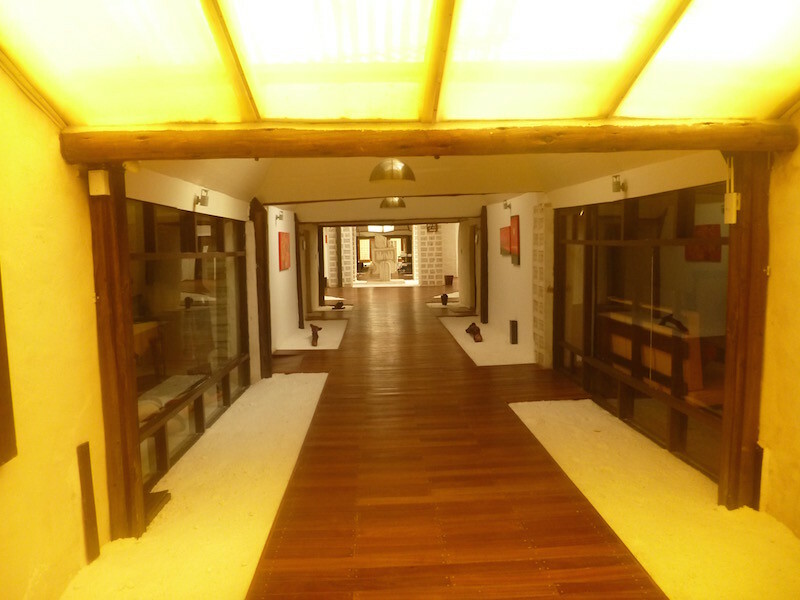 On the edge of the Salar is the Palacio del Sal, the world’s first salt hotel. Much of it is made from salt. Probably a difficult place to stay if you’re on a low sodium diet. 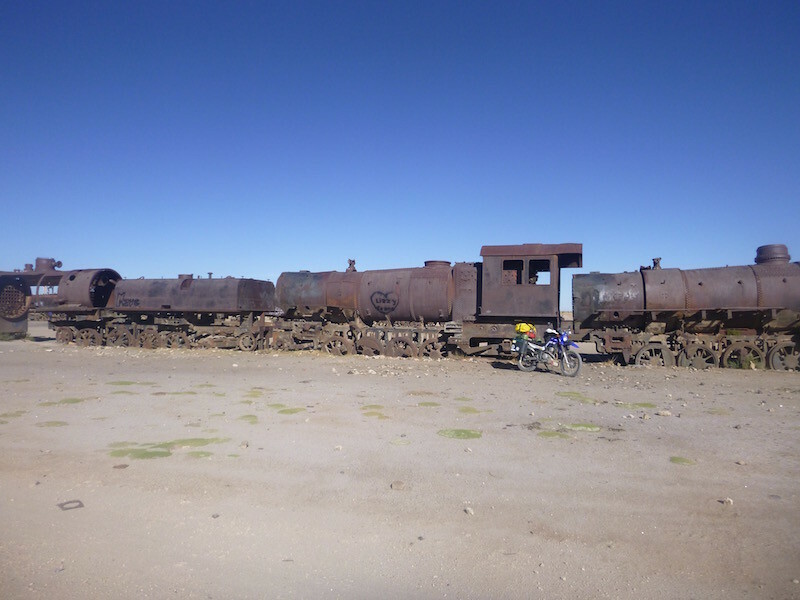 The other big draw in Uyuni is the train graveyard. Personally, I found it a bit ironic. 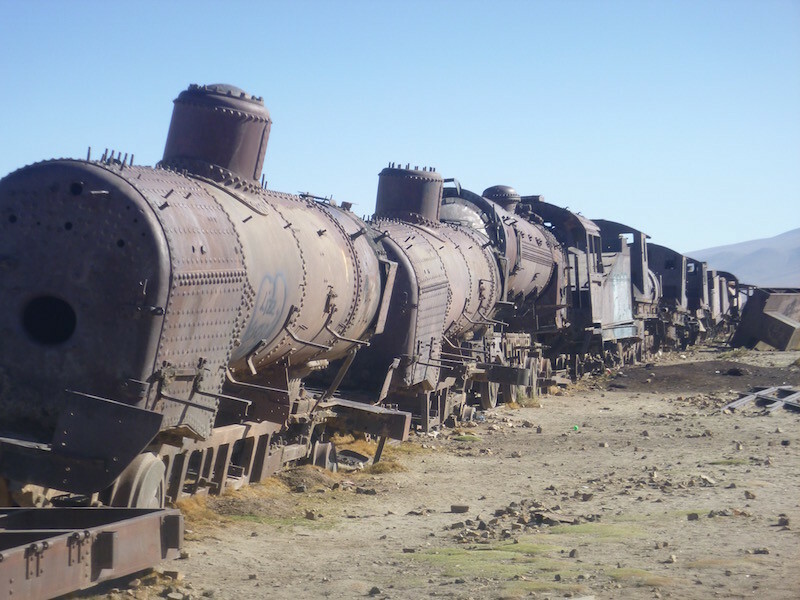 In the late 1800’s, British engineers, invited by British-sponsored Antofogasta and Bolivia Railway Companies, were invited to build a railway to transport minerals from here. The local indigenous people felt it was an intrusion into their lives, and constantly sabotaged it. 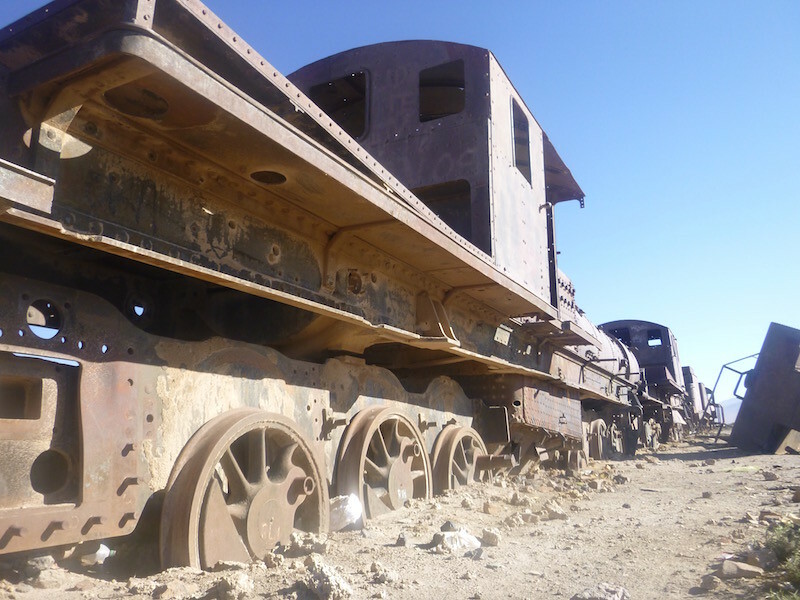 In the 1940s the mining industry collapsed and the trains were abandoned. 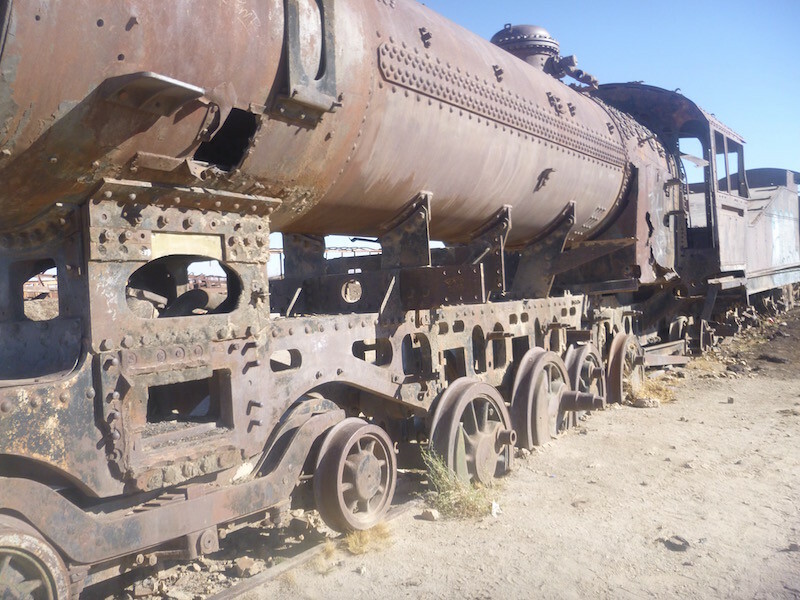 Pieces of the railway and trains can be seen scattered throughout the streets of Uyuni as memorials and pieces of art. So in the end, the thing that the local people despised and wanted to rid their lives of, provides a good part of their livelihood in tourism, and they celebrate it. 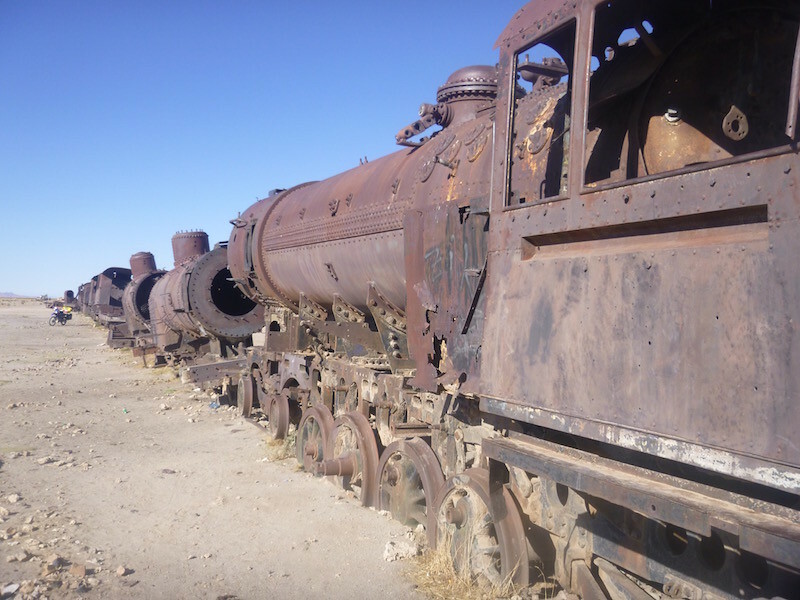 Still, the train cemetery is pretty cool. Leaving Uyuni, I topped off my fuel (took two tries to get someone to sell me gas), as the next leg was 275 miles across high desert dirt roads which (allegedly) had no fuel purchase options in between. 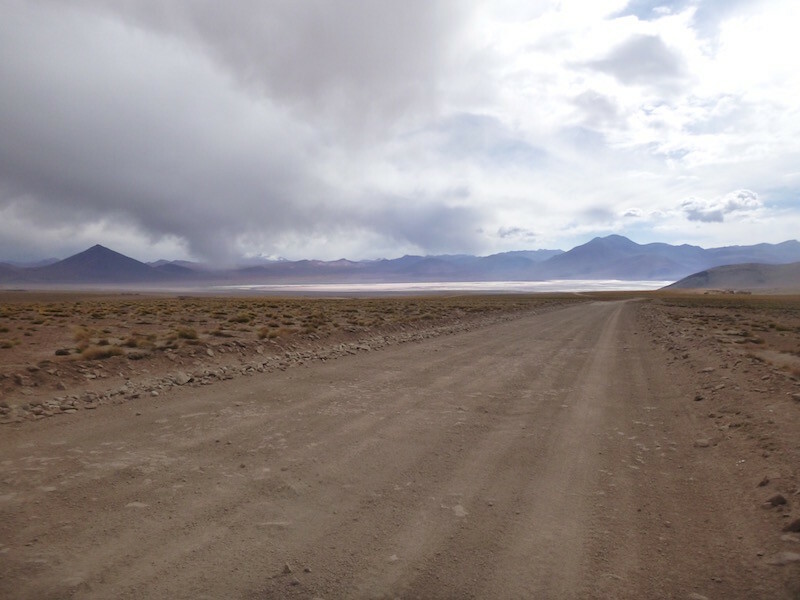 The first ninety miles from Uyuni to Alota is a fairly well maintained dirt road used by buses and 18-wheelers (it’s the main highway), and it was common to have them pass me going the other way at 60 to 70 mph on the dirt. In Alota, I rode through the very small village until I found a guy who looked like he might be able to help me. I rode up to him and asked, “Donde puedo comprar gasolina?” (Where can I buy gasoline?). He just looked at me and smiled, pointed to his chest and said, “Yo”. Amazing. In a place that doesn’t sell gas, I find the one guy in town that will sell me five liters from a plastic Jerry can. Now I was assured I could go the distance. The next 150 miles or so are definitely not highway. 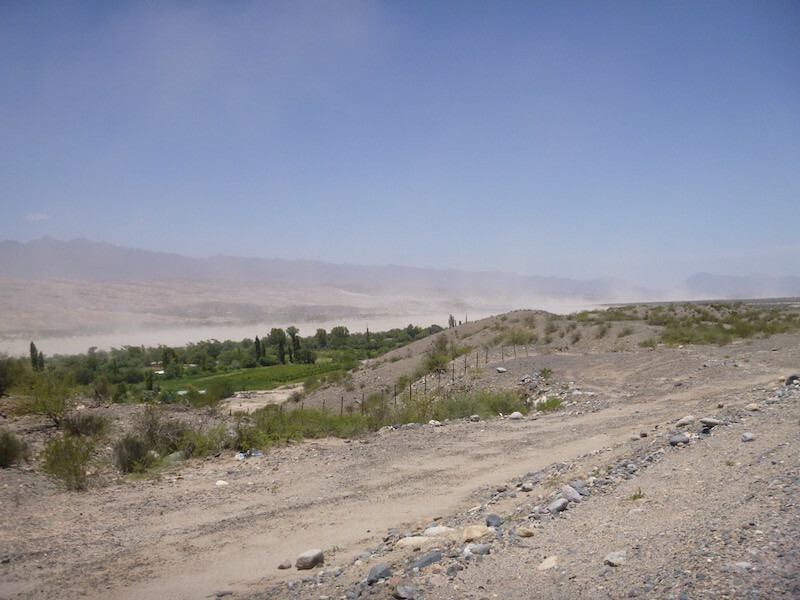 From Alota to the border with Chile, through the Eduardo Avaroa National Reserve, the road is mostly sand, rocks, and gravel. This, I found out later, is apparently known as the “Laguna Route” as it passes several high elevation lakes. Definitely no buses. No trucks. An occasional four wheel drive SUV. While ahead looks more ominous. In hindsight, I should have paid more attention to the omens. This is one of the most desolate roads I have ever ridden. In well over 100 miles, I rarely saw another vehicle or person. Lots of Llamas though. Coming into Laguna Colorada late in the day. Much of the road is between 14,000 and 16,000 feet elevation. Here it is just over 16,000 feet, and not a soul to be found. The GPS says 3:40pm, but that’s Texas time. It’s either 5:40 or 6:40pm here, depending on how close to the border I am, I think. The definition of stark beauty. You definitely have to keep your attention on the road here. As soon as you think you are on a hard surface and can speed up, you suddenly hit a one- to two-foot-deep section of “fesh fesh” (talcum powder-like dust) or gravel. And that’s what happened next. 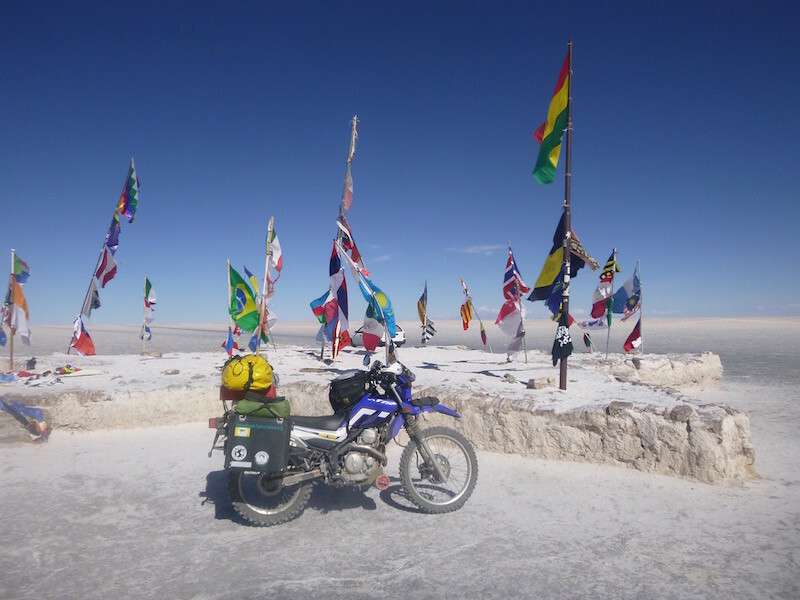 So, in keeping with that theme, I will skip Cochabamba and move on to my travels south towards Potosi and Uyuni. My attitude has been suffering as of late, mostly due to the corruption and my treatment at the border crossing into Bolivia from Peru — which unfortunately pre-shaped my opinion of Bolivia — as well as the ridiculous inability to buy gasoline in Bolivia, which eats up a lot of travel time, as it typically takes three stops before I find someone that will sell me gasoline. My attitude improved today. I attribute it to staying out of large cities (and the terrible traffic), and getting back to the country and the rural people, who are almost always friendly. 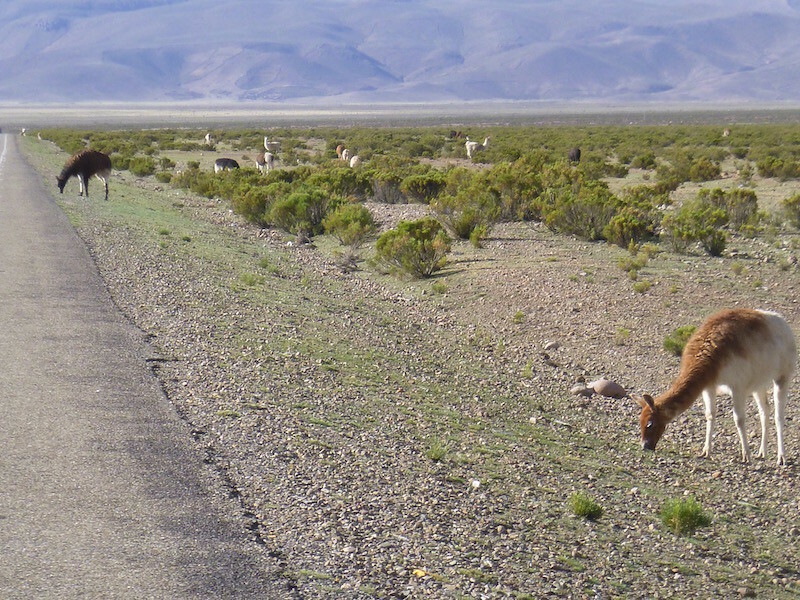 Near Challapata, between Oruro and Potosi. The Dakar race came through here about nine days ago. I just barely missed it. It wasn’t long before it started raining again. Then it got really dark. Then the lightning started. Then the sleet. And of course this is all at around 13,000 feet elevation, so yes, it was quite cold. It was getting late, and becoming clear that I was not going to make it to Potosi before dark. I began scanning the roadside for possible places to camp. Due to the large amount of rain the night before, and the rain now falling, most everything was muddy and there were a lot of standing puddles. Just before dark, the rain let up briefly and I spotted a dirt and gravel road going off to the east. I turned and headed down a couple hundred yards and found an old rock wall out of sight of the highway. The tent went up quickly, just before the rain resumed. The rain stopped in the middle of the night, and in the morning it was a damp but beautiful sight. 13,200 feet elevation. At least it quit raining. Beautiful morning. After coffee and allowing the sun to dry the tent, I packed up and headed south. 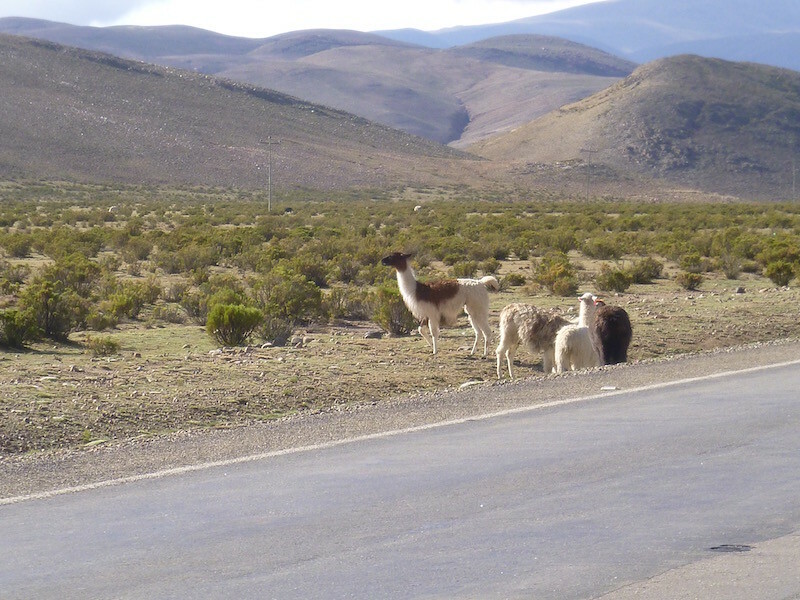 Hundreds of these guys along the road to Potosi and Uyuni. Some of them will suddenly run across the road. In a contest between Llama and Llamaha, nobody wins. 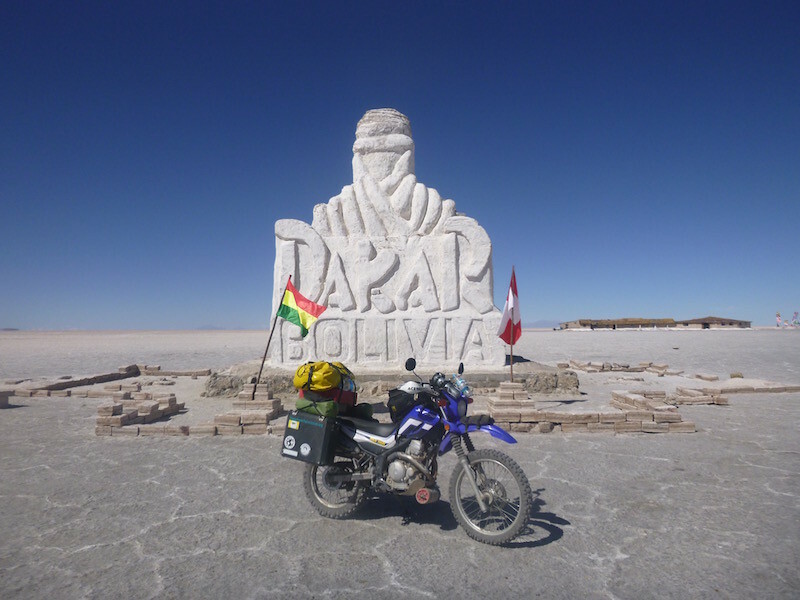 At a gas station in Potosi (the second one I tried — I was refused at the first), I met a couple from Colombia on a BMW F800 headed north. They had been to Ushuaia and were moving very quickly home. 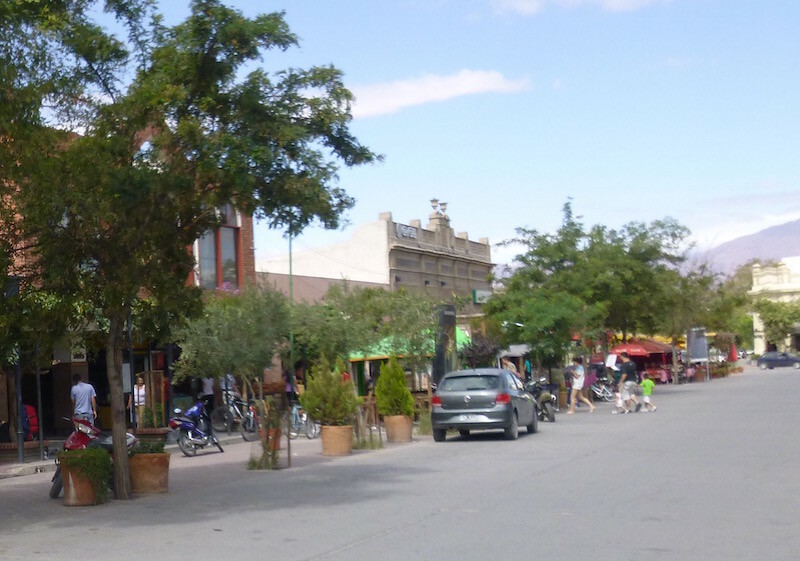 Potosi claims to be one of the world’s highest cities at 13,420 feet, and was home to the Spanish colonial mint. 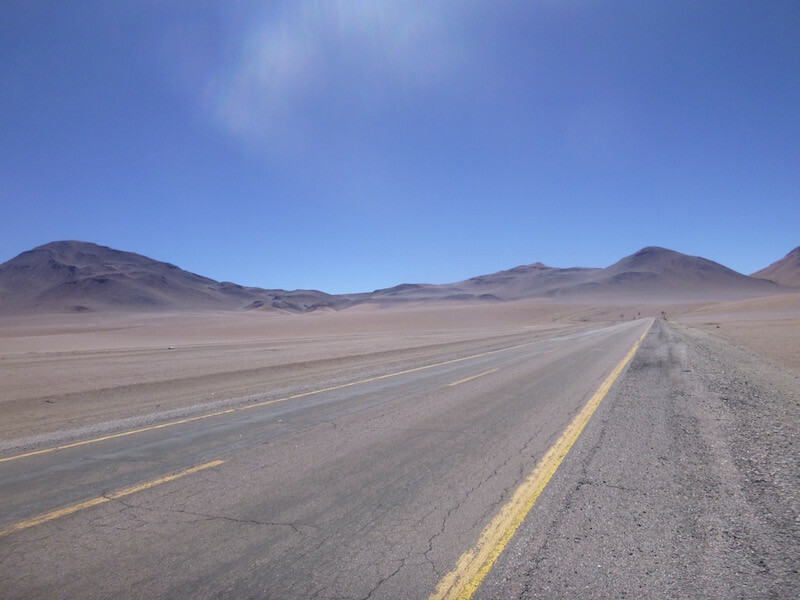 It’s not very large, and I passed through it quickly headed to my destination: Uyuni. The road looked like this for about 90 miles. With virtually no traffic. I later found out why. But it was fun while it lasted. 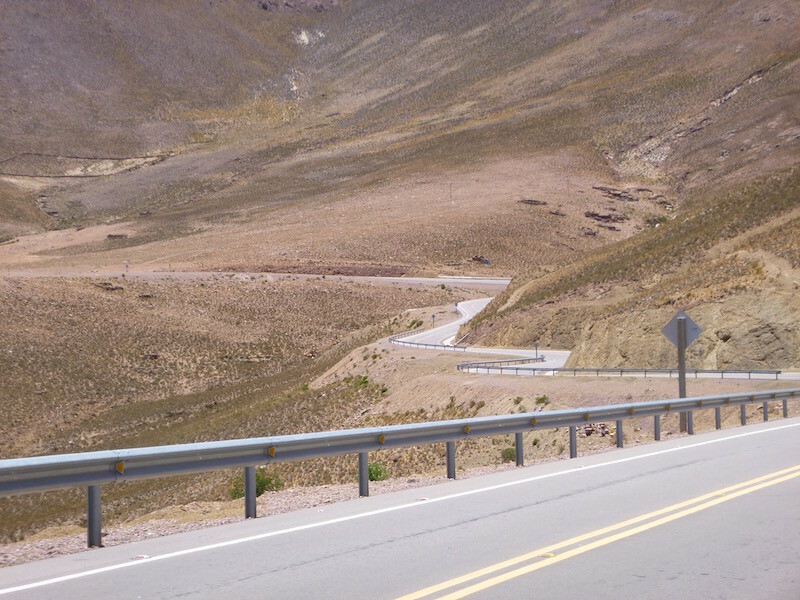 The highway climbs and dips in the mountains, but mostly stays around 12,000 feet for the 130 miles between Potosi and Uyuni. 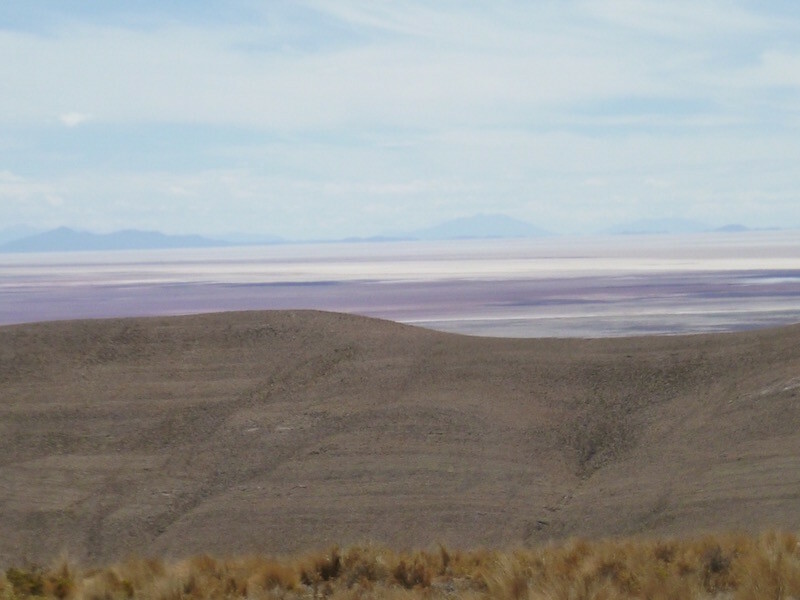 Suddenly as you round a bend, the Salar de Uyuni comes into view. The city of Uyuni sits at the edge of the Salar, and from high above, the city looks like something from Burning Man. 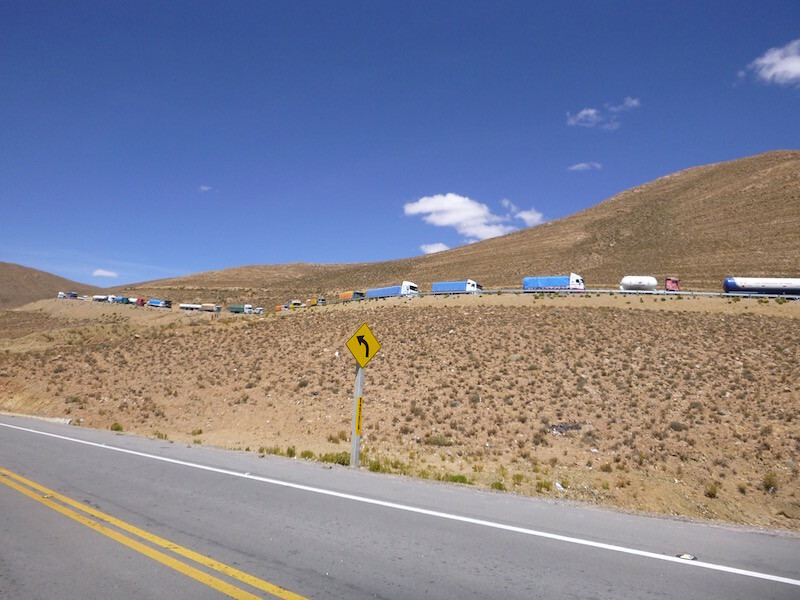 As I descended towards Uyuni, I came upon another line of stopped traffic. I worked my way to the front, and this time it was clear that it wasn’t a rock-slide, although there were plenty of rocks in the road. Unhappy, but non-threatening, at least to me. They smiled, rolled a big rock out of the way, and waved me through. Looking back at the traffic blocked by the protesters. I’m not sure what they were protesting, but they let me through. 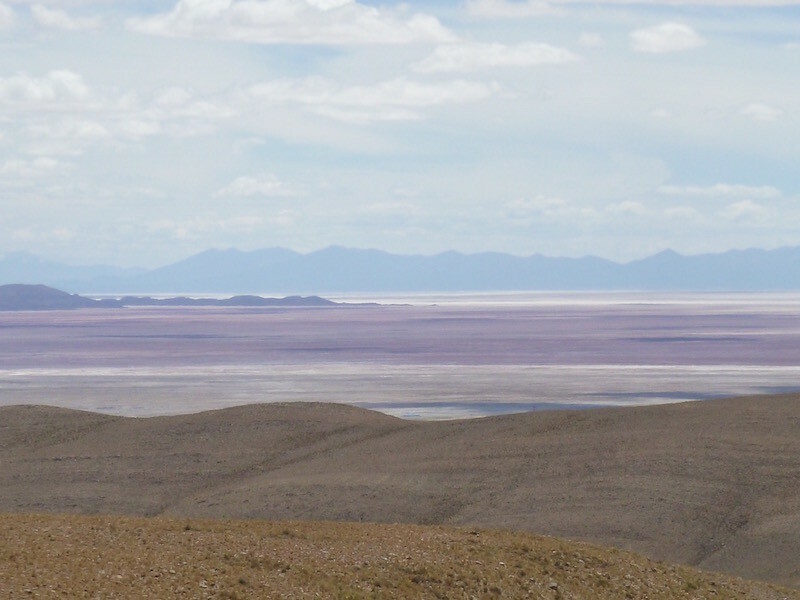 As I continued the last mile and a half or so to Uyuni, I passed dozens of tourists headed the other way on foot– up the mountain, with their backpacks and roller bags. They were all trying to get to their bus, which was waiting, stuck on the other side of the blockade. 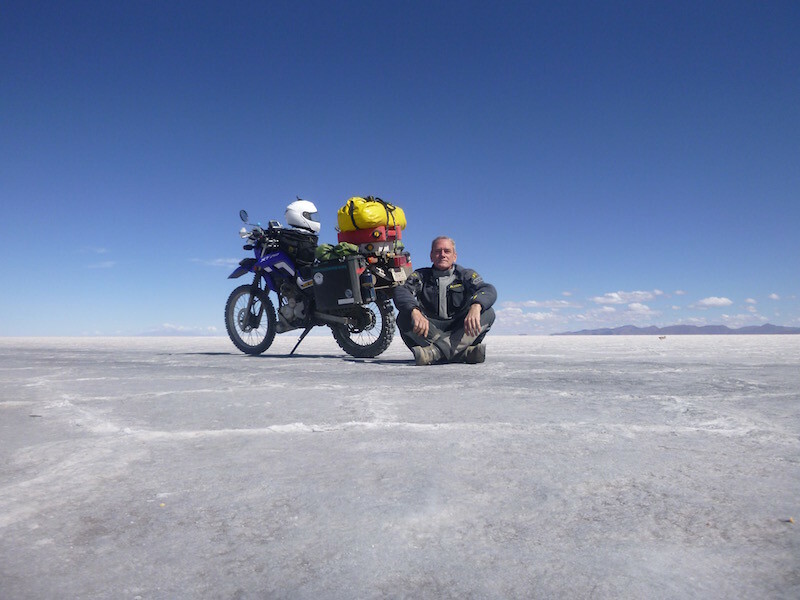 I arrived in Uyuni mid-afternoon, and checked into the Hotel Inti, which has a garage for motorcycles. There is a Honda Transalp here also, with Swiss plates, though the hotel owner told me they were from Canada. I’m thinking they may have ridden from Canada, but are probably Swiss. Perhaps I will find out later. Tomorrow I will visit the Salar, and perhaps work my way a little further south, setting up for my crossing into Chile. 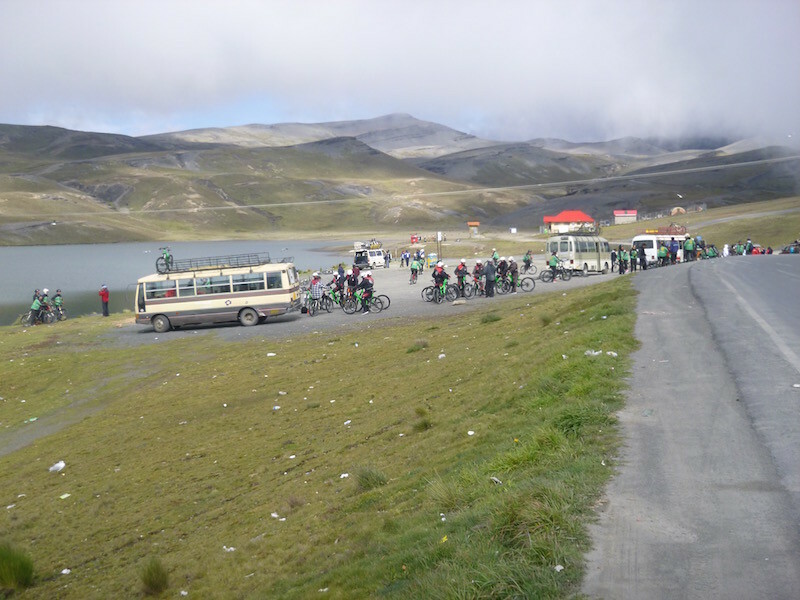 Bicycle staging area at the top of the mountain, several miles before the turn-off to the Bolivian Death Road. 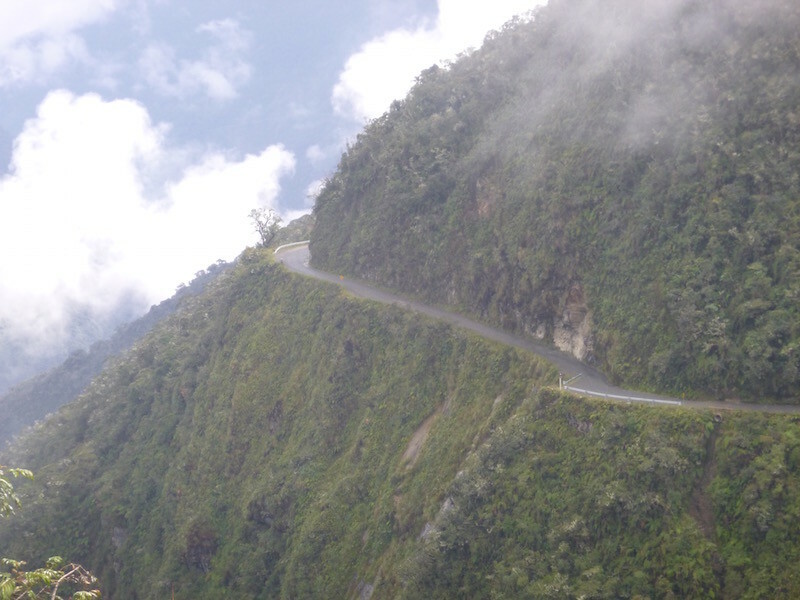 That’s pretty much today’s Bolivian Death Road as far as I can tell from what I saw. 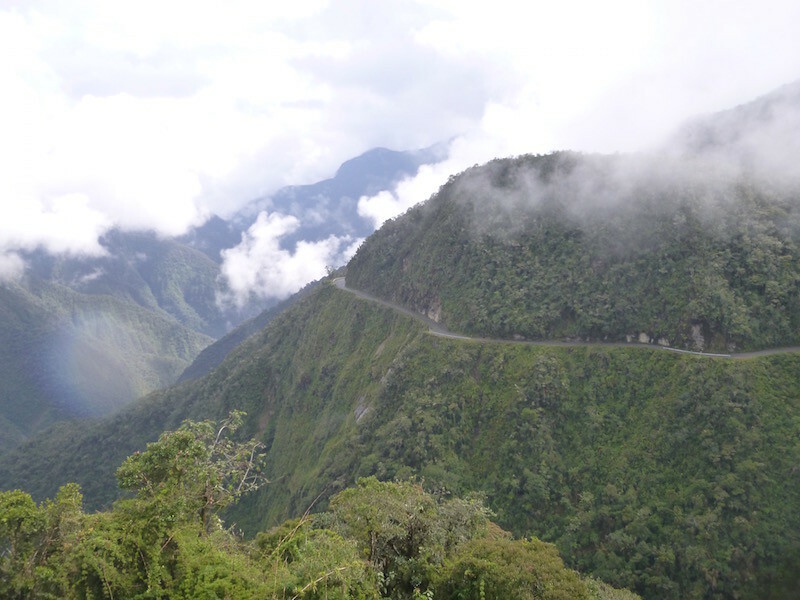 I had read so much about the North Yungas Road over the years and it was high on my list of must do’s. I have absolutely no doubt that back when this was the main road between Coroico and La Paz, this was a dangerous road to travel. Many people died here, and occasionally some still do. It’s not the road’s fault. The road is wide enough to negotiate, so long as you aren’t passing a bus or a truck (which, by the way, no longer use this road as there is a beautiful paved two-lane highway just north of here). Drive responsibly, with some respect for the circumstances, and you’ll be fine. Drive (or ride a motorcycle or bicycle) like an idiot and the consequences here will be severe. 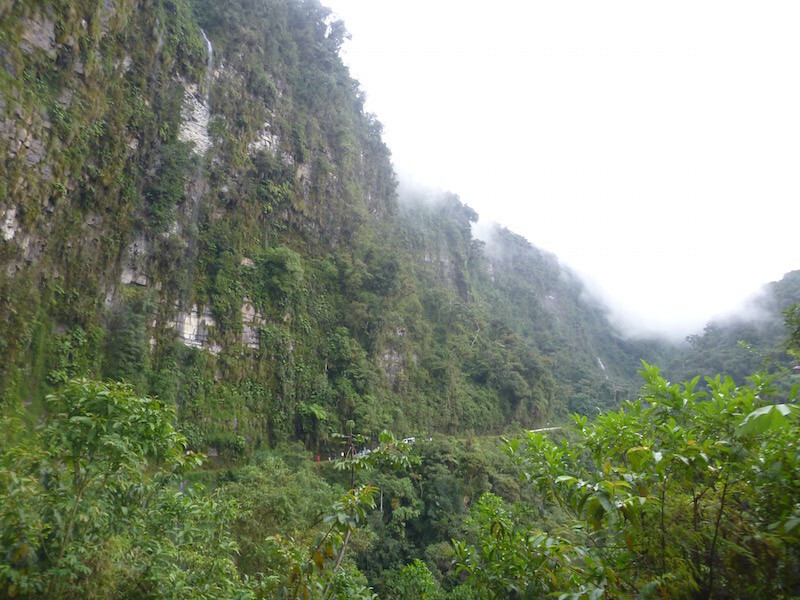 Since around 2006, when the new highway opened, the “Death Road” has become mostly just a tourism venue. Vans and buses haul hundreds of tourists and mountain bikes a day to the top of the mountain, where they can coast down the highway to the turnoff to North Yungas Road, then take the gravel road to near the town of Coroico, where they are picked up and returned to La Paz. In return, like my volcano-boarding experience in Leon, Nicaragua, you get the t-shirt for bragging rights. Nothing says “Adventure Hero” like a t-shirt with a bicycle and the words “Death Road” on it. Back when this was a heavily driven road, the “Keep Left” rule was instated. This allows the driver to always be on the “cliff side” of the road, so he can better judge where his outside wheels are in relation to the drop-off. The rule continues today. The first six miles or so of the road are absolutely spectacular. 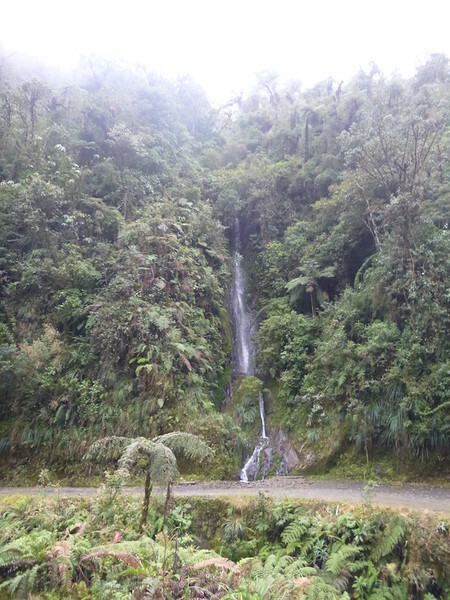 Often in the clouds, the jungle-like setting adds to the spectacular waterfalls that fall onto and over the road in many places. The road is quite narrow, with only a few well-placed guardrails. A mistake here will most certainly prove fatal. 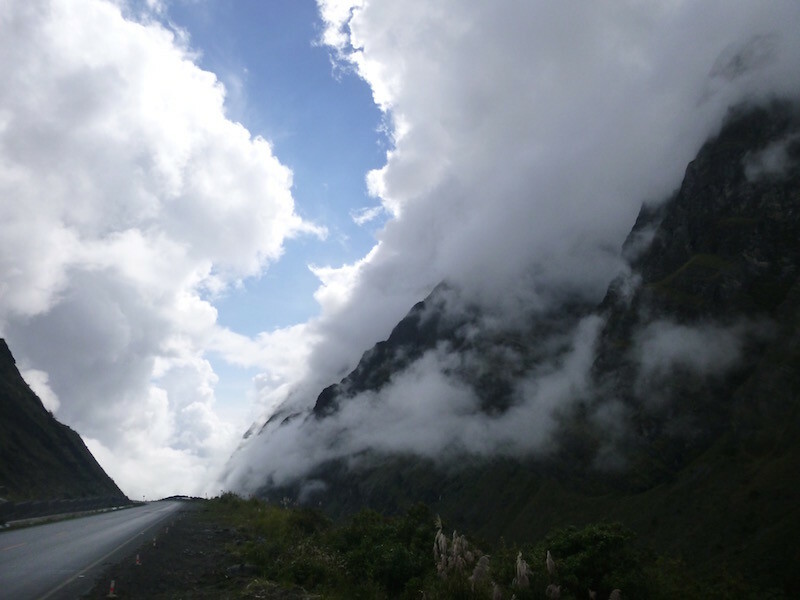 The highway on the way to North Yungas. Cloud formations were pretty phenomenal. Lots of waterfalls. Some next to the road, some over the road, some onto the road. Hard to see here, but there is a series of water cascading down onto the road here, landing just about in the middle. You can ride inside or outside of the waterfalls. 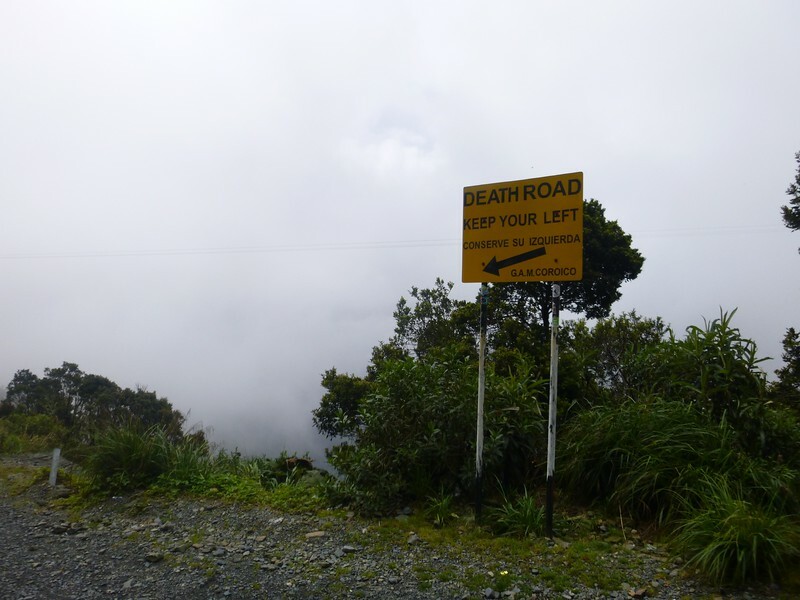 Mistakes are most likely fatal here, thus earning the “Death Road” moniker. Near the top I ran across Barbara Kennedi and her companion Peter, on KTM 1190 Adventure R models. 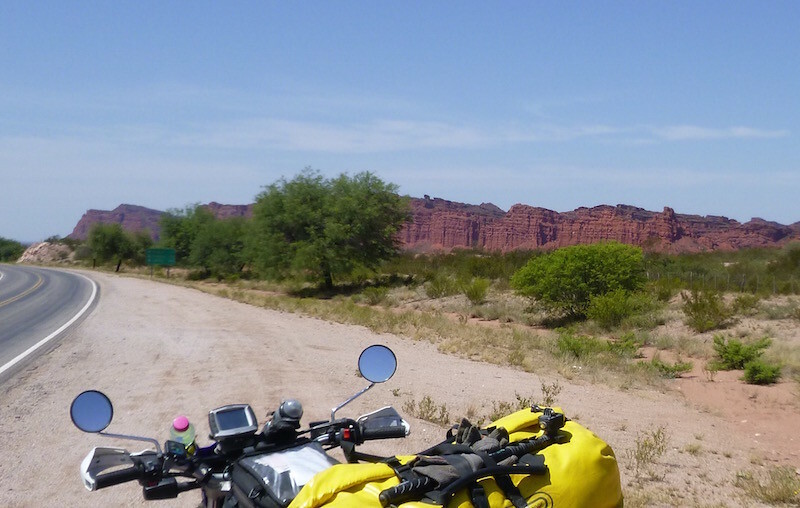 Barbara is a KTM employee in Austria, and she and Peter are riding around the world in stages. They are doing a similar route right now to mine — to Ushuaia then Buenos Aires. But they will ship to Dakar when I ship to Cape Town. There is virtually no traffic on this road, which of course is good not only for the mountain bikers but for me as well. 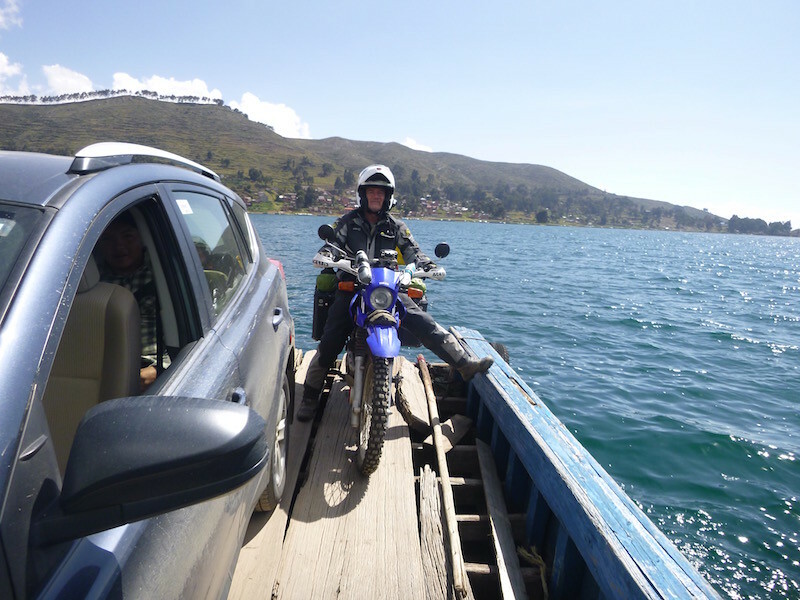 It doesn’t take long to complete the ride and return to La Paz in the same day. I went from clouds, fog, cold and rain at the top, to sun, hot and dry at the bottom, back through fog and rain across the top and once again into heat as I passed through La Paz to the Colibri Camping spot that I will call home for another night. In my opinion, riding through traffic in La Paz is more dangerous than the “Death Road”. I was a bit underwhelmed at the road and it’s hype. 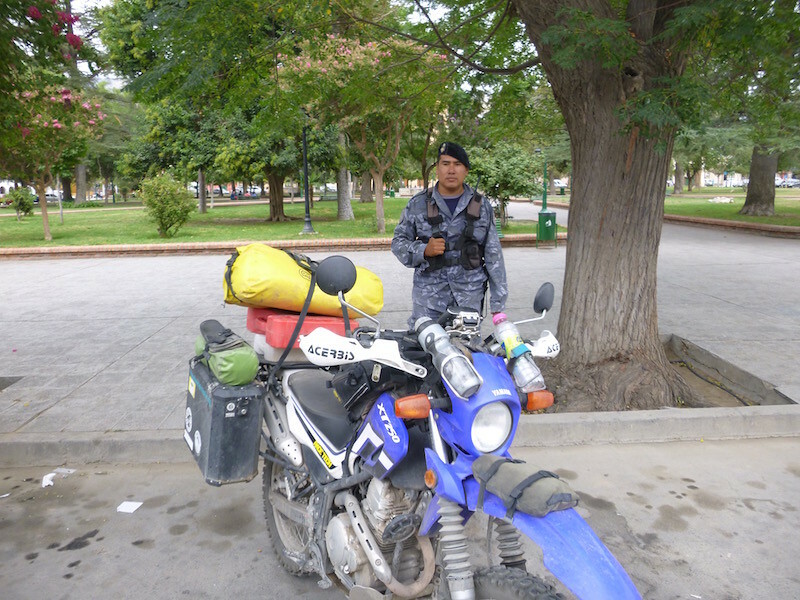 But I would still do it again if I happened to be in La Paz and had access to a motorcycle. At least the first six miles or so. And my advice if you are considering doing this road: be sure you turn off the highway and onto North Yungas before 10am. After that, and you’ll be picking your way through hundreds of mountain bikes. Which gives me an idea for a new business venture. I’m going to find the road in Austin where the most bicyclists have been killed. Then I’m gonna market the heck out of it as “The World’s Most Dangerous Road on a Mountainbike” (okay, maybe Texas’ most dangerous. Okay, maybe Austin’s most dangerous. Wait, where’d the hype go?). Then I’m gonna charge people a ridiculous amount of money to ride a mountain bike down the road, and give them a t-shirt if/when they survive. Yeah, I know, it’ll never work in the States. Because there’s nobody to sue in Bolivia. Just before La Paz, I have my first encounter with being refused fuel. Bolivia laws require fuel sellers to complete a ridiculous amount of paperwork when selling fuel to foreigners, including inputting passport number, name and country of residence information, as well as completing a detailed receipt (or two, in some cases). In addition, there is a “Foreigner” price and a “Boliviano” price for fuel. Yesterday, I paid just under five dollars a gallon, where the locals-only price is around $1.99, and got to experience the hassles the attendants encounter when following the rules; by the time my purchase was complete, there was a line of cars out to the street, waiting. No such luck today. The attendant takes one look at my Texas license plate and refuses to sell me fuel. I ask if he will sell me fuel without a receipt (“sin factura”) at the higher rate. Nope. So, off I go in search of fuel. Five hundred feet down the road, I run out of gas. Fortunately, I have fuel in the spare can on the back of the bike, but I still need to find fuel to replace it. Oh $#*! Quick! What’s the Spanish word for “stuck”? My mind was scrambling but coming up blank. I knew the word for “Foot”: Pie. But I couldn’t come up with a word for “stuck”. Quickly!….alternative sentence structures: “wedged”? “lodged”? “Unable to move”? That’s it! Foot no move! “Mi pie no puede mover!” Too late. Nice thought, but about a second delayed. Over I went. I had left Copacabana, headed for La Paz. There is a short ferry crossing, and about a dozen of these large, rectangular wooden barges with outboard motors to carry vehicles across Lake Titicaca at this small gap in land. The “front” of the barge is open, and is pulled up to the land, where wooden ramps are positioned to load cars, truck, buses, and motorcycles. On the other end, the same “front” end of the barge is pulled up to the ramps, and you have to back off of the barge. On my barge, they loaded a large truck, an SUV, and last, me. Which meant I was first off, backwards. I felt like my taillight was hanging off the open end of the barge and I was just inches from falling off. I’m sure it wasn’t that close, but I wasn’t going to get off the bike to look…there wasn’t a lot of “floor” on the barge either; just enough to get the four wheels of a truck or car onto the barge. No way for me to make a U-turn and ride off. On the way across, I asked an elderly gentleman who worked on the barge to take a photo (the one above). We began talking (in Spanish), and he asked how many accidents I had had on this trip, and how many times I had tipped over. “Nada”. That was a mistake. Never should have said it. When we docked on the east side, I began to unload, rolling backwards off the barge. About half way down the ramp, while looking to my left at the kid on the ramp that worked with the barges, my right boot got stuck in between two of the wooden boards, and wouldn’t come out. Front wheel locked, the bike kept sliding down the board. Before I could do much more, my leg reached its’ limit, and down I went. I was very, very lucky. The ramp that we had pulled up to went all the way across the back (front?) of the barge. If it had only been wide enough for the car tires, with a gap between, the bike would have fallen further than 90 degrees, and my ankle, and possibly my lower leg, most assuredly would have snapped. As it was, I was pinned and it required the people from the SUV to lift the front of the bike and free my foot. Embarrassing. And my first tip-over of the trip. But other than a little twist in the knee and ankle, I am unscathed, and still rolling….